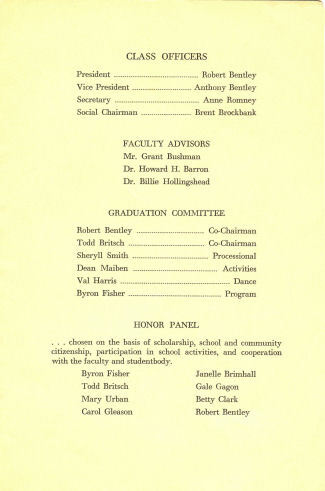 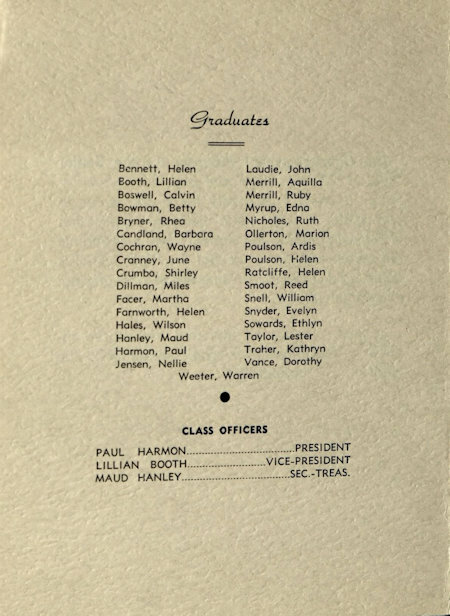 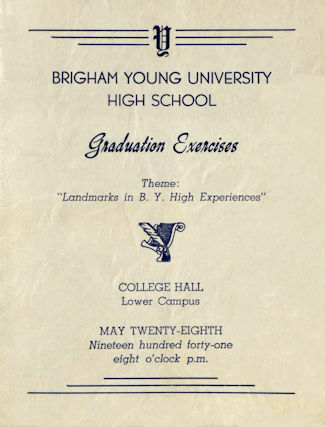 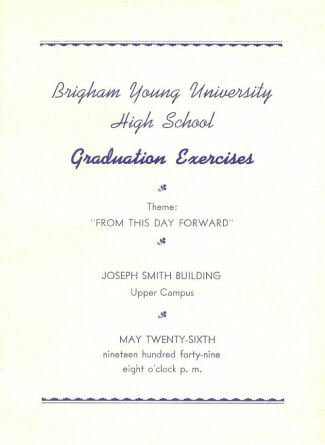 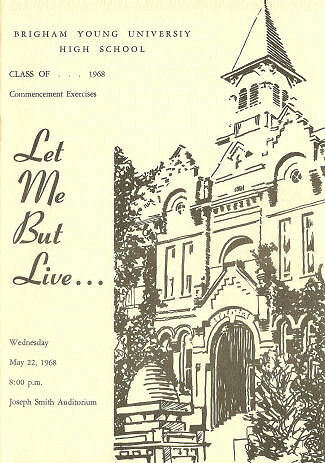 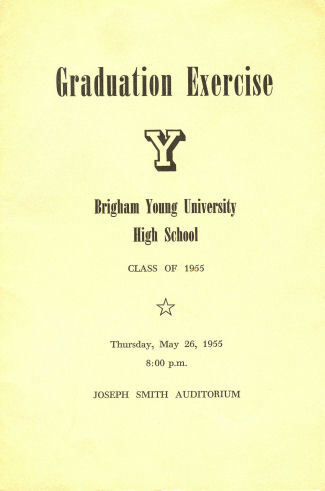 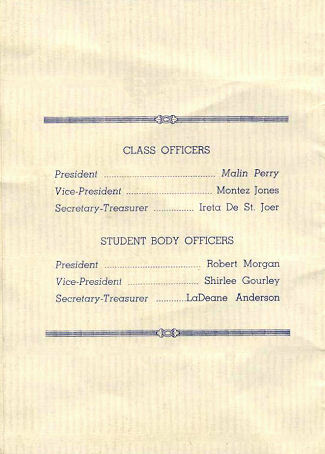 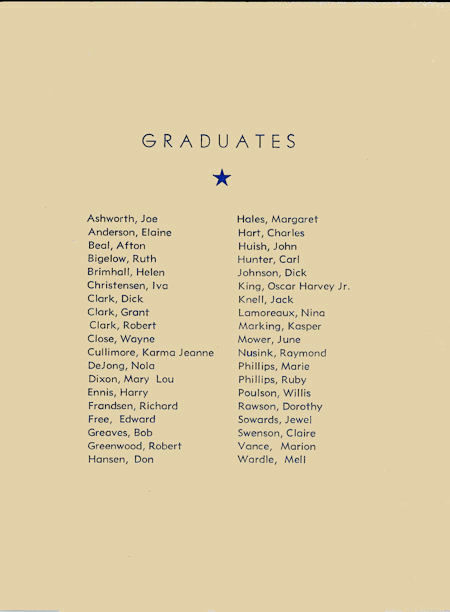 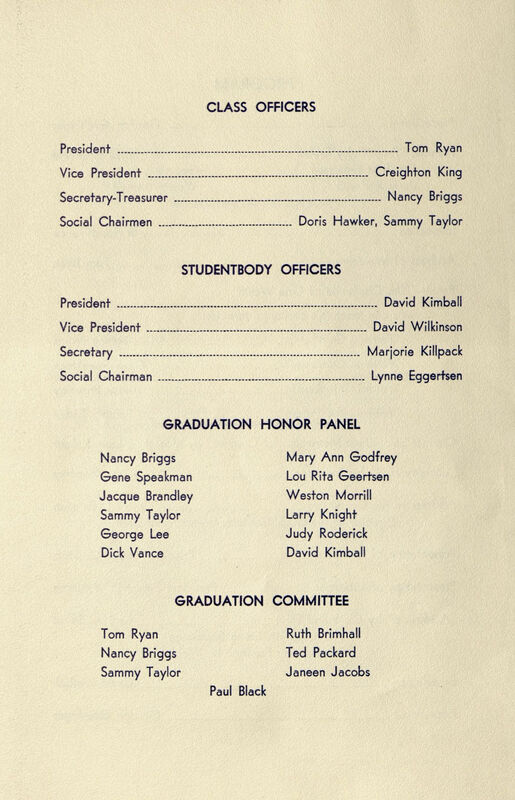 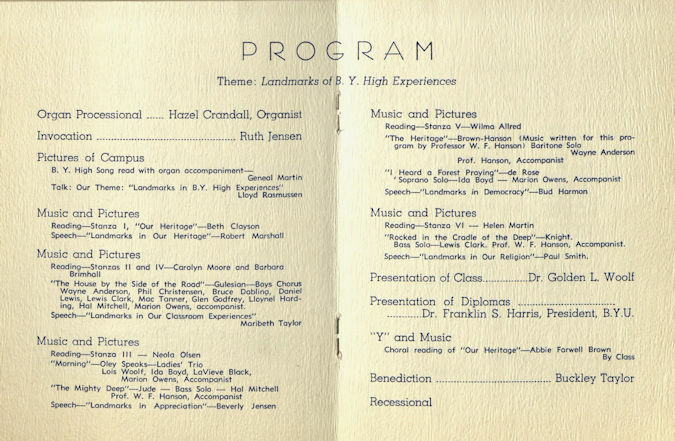 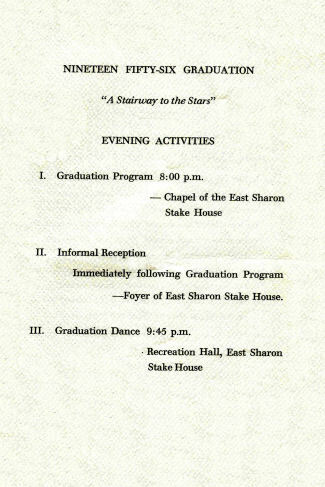 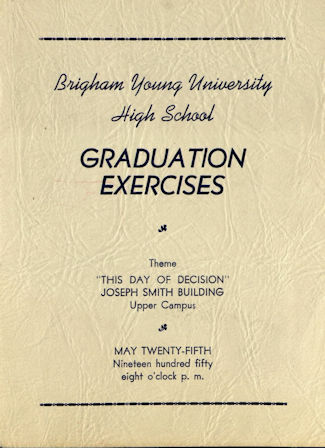 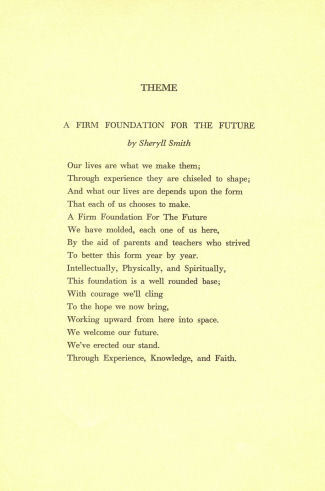 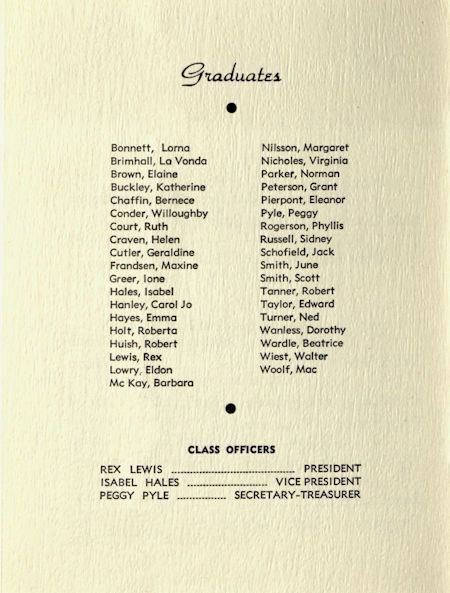 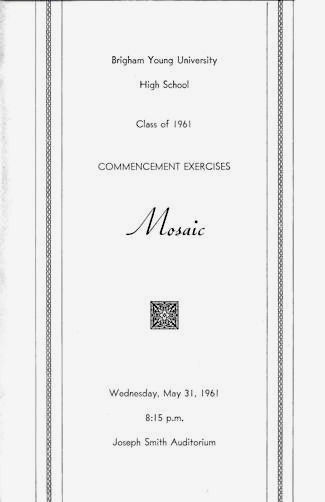 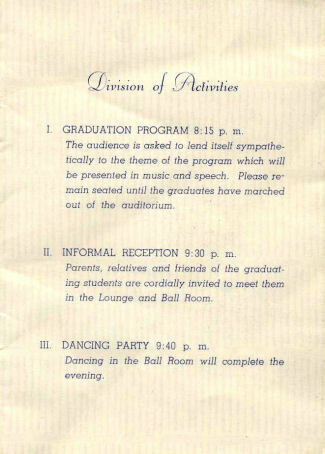 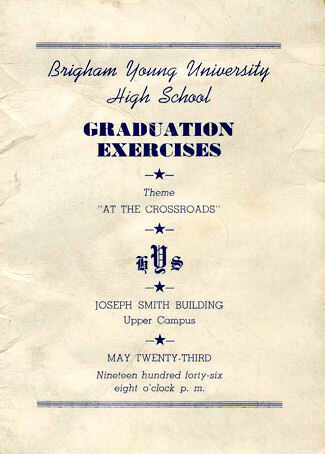 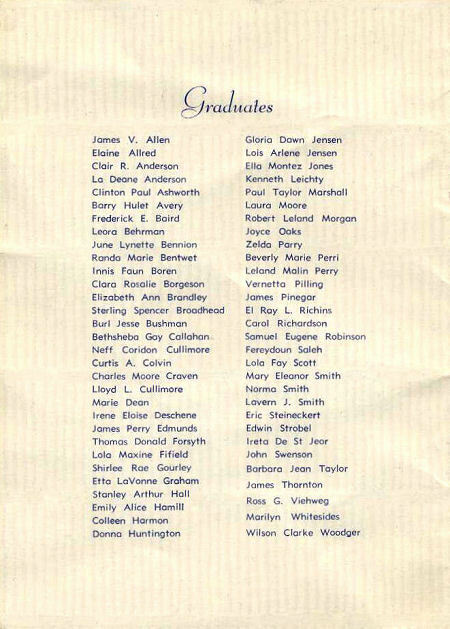 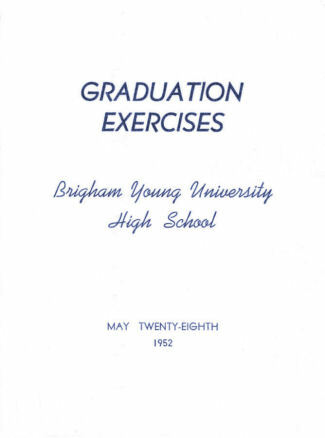 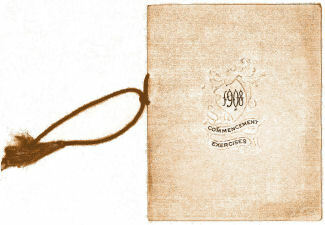 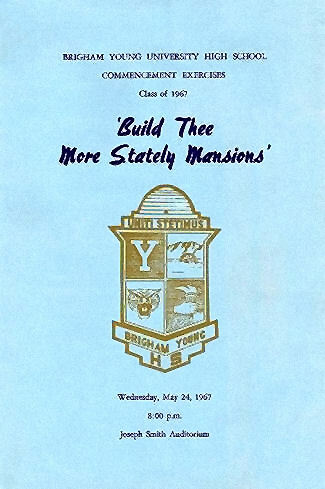 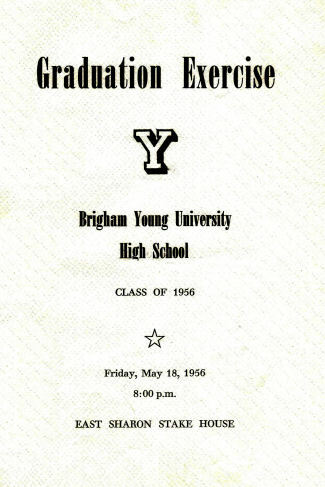 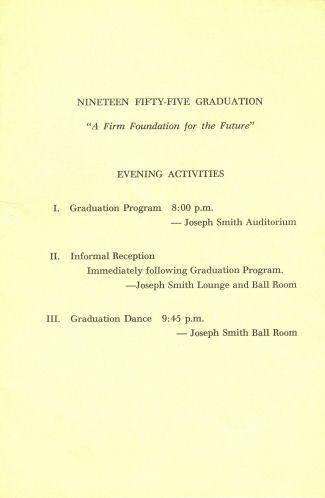 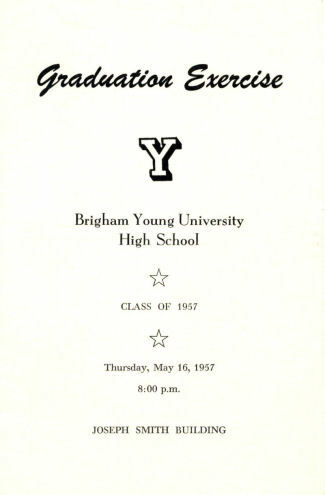 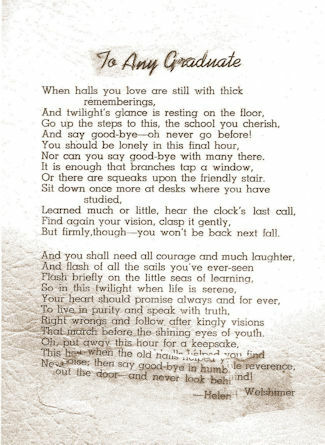 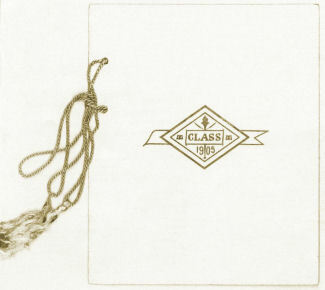 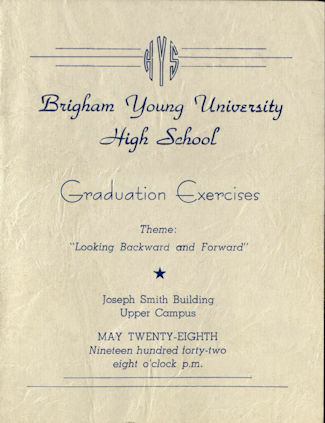 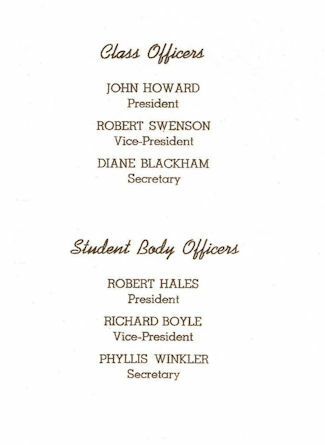 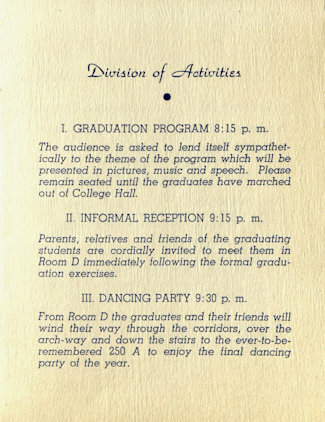 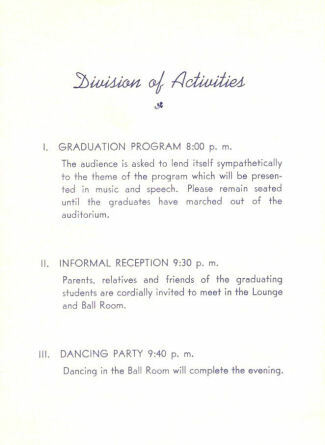 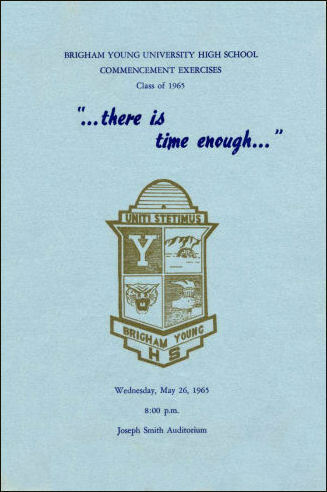 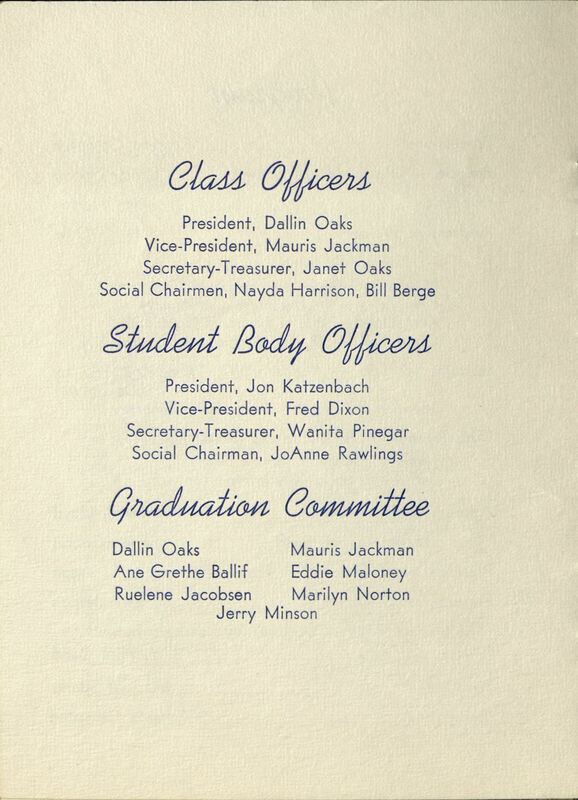 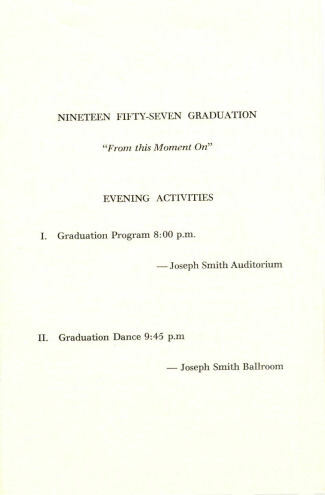 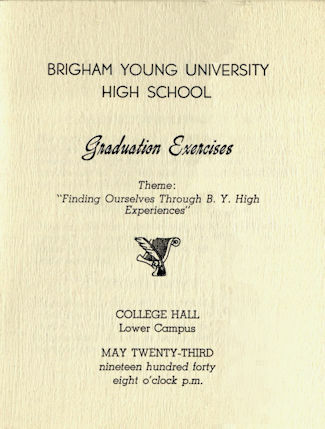 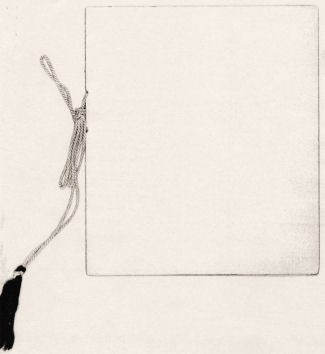 Since BYH's first graduation in 1904 until the final one in 1968, 65 graduation programs were printed. 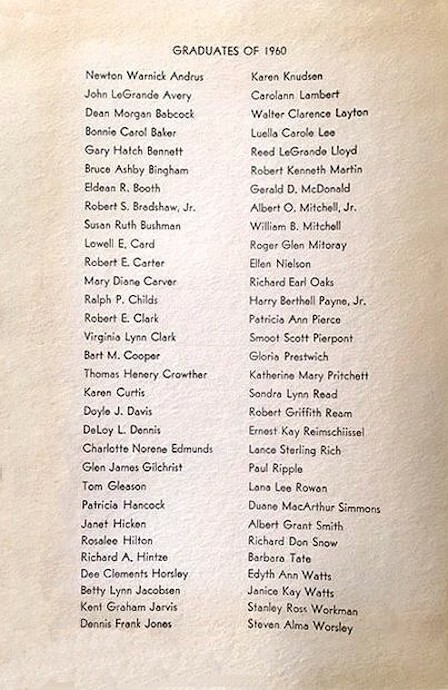 We had 21 of them until 2016, when we obtained 18 more. 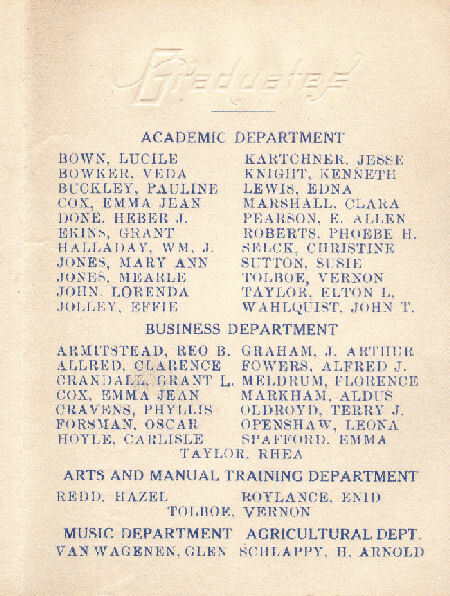 In 2017 we received a gift of the program for the Class of 1948. 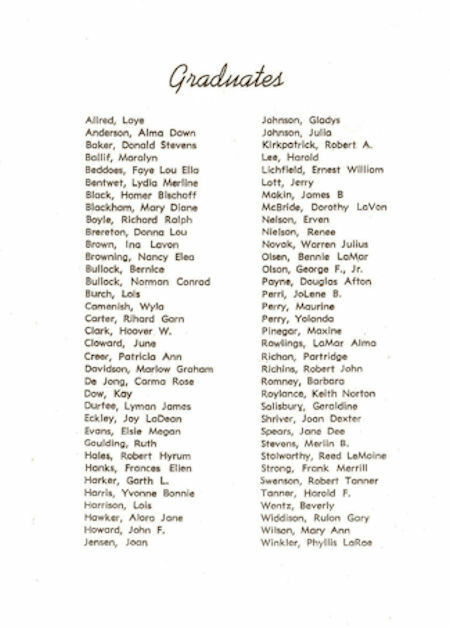 We now have 61 percent of the 65 programs! 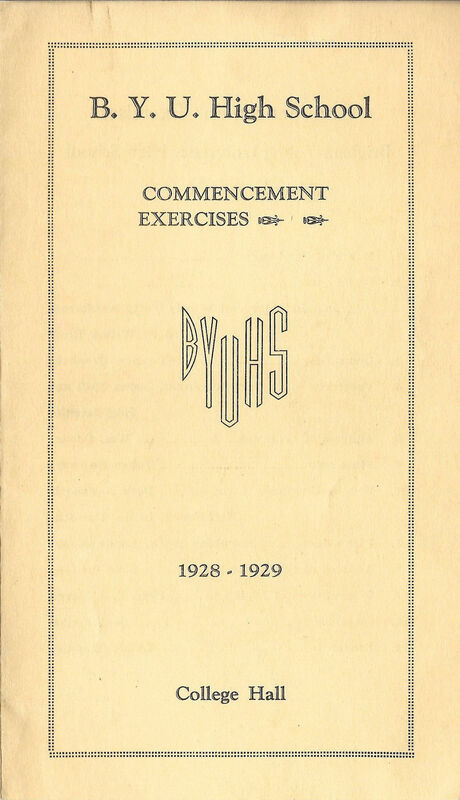 BYH graduation programs are rare documents. 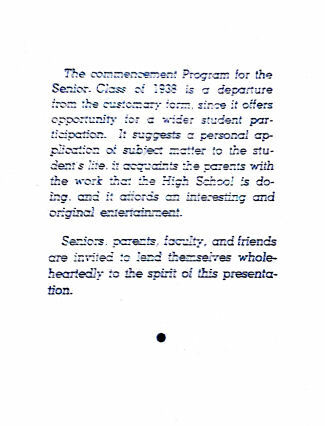 They were usually distributed to parents and others in the Commencement audience, but were not given to the graduates themselves. 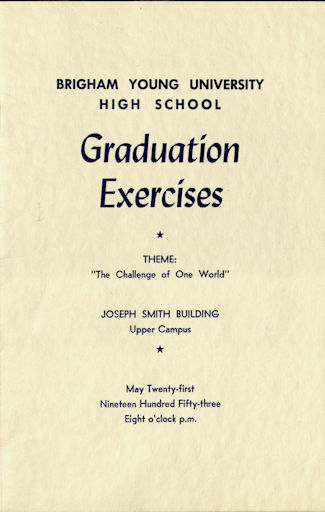 The new graduates were understandably focused on receiving their diplomas, then scattering to the four corners of the earth after the Commencement. 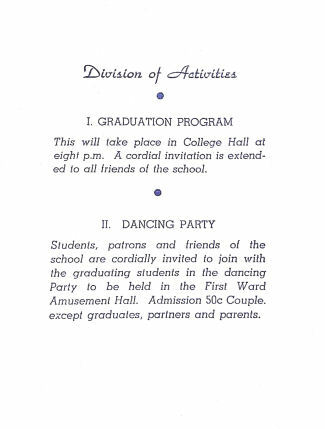 These programs are not official documents. 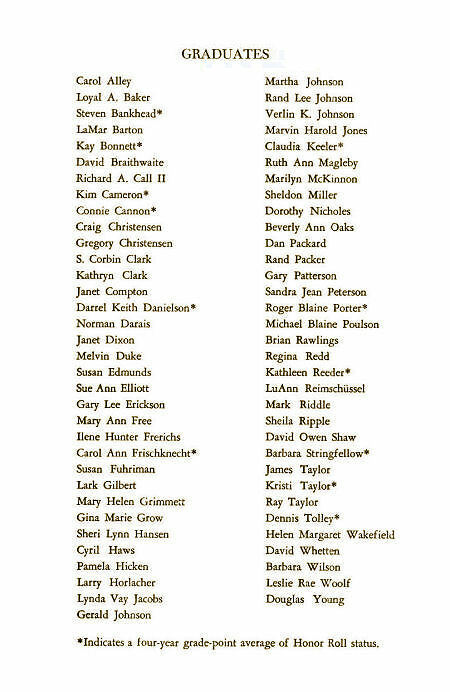 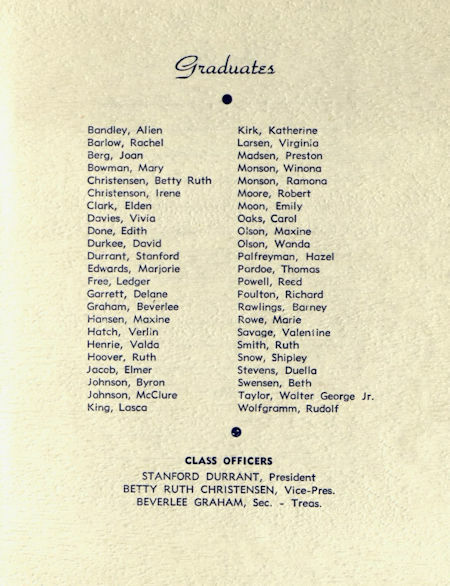 Sometimes they included people who did not graduate, and sometimes they inadvertently omitted some who did graduate. 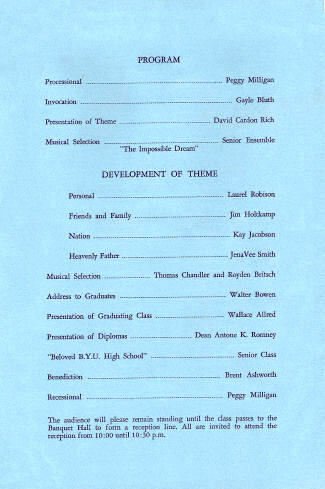 Nevertheless, we have found that they are often more accurate than senior class photos and yearbooks. 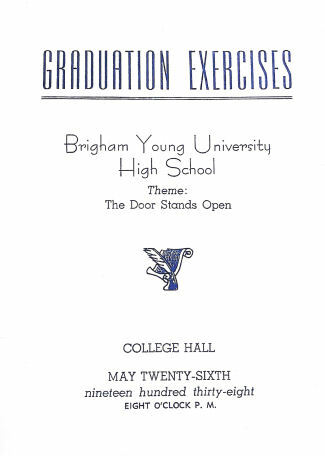 If you possess a BYH graduation program that does not appear below, we invite you to send it in -- we would like to include it! 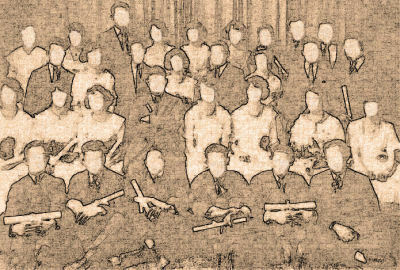 Please help us to reach 100 percent! 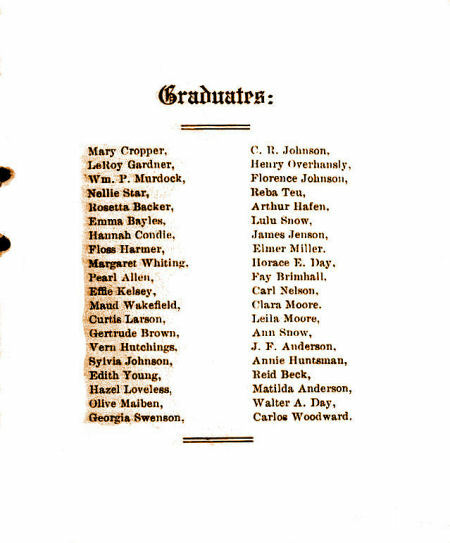 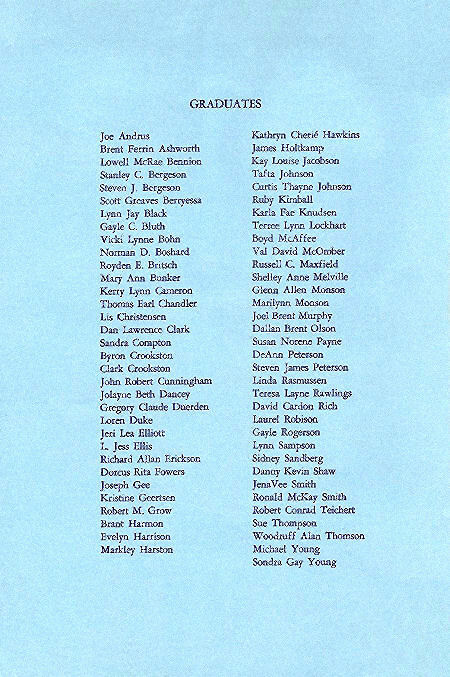 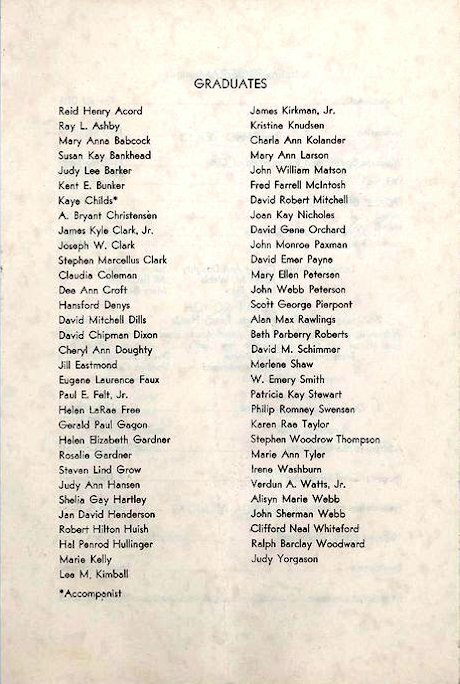 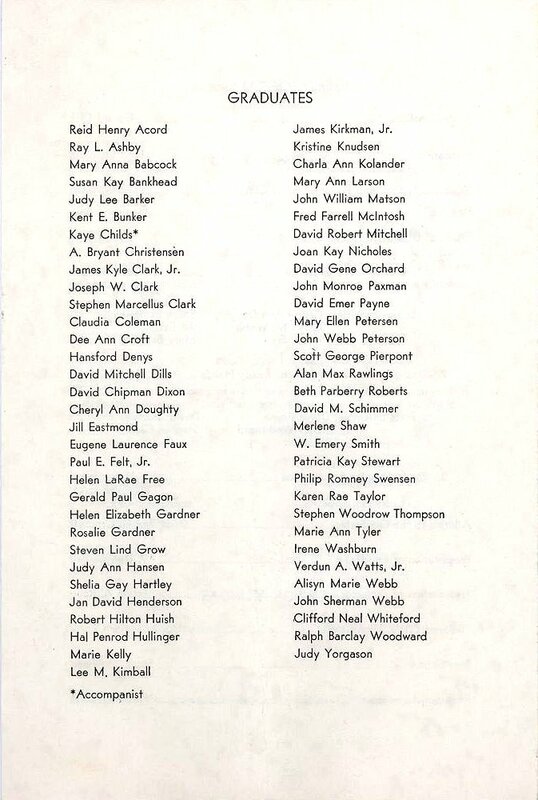 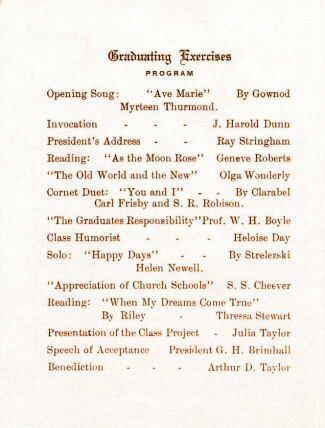 The above 1904 BYH graduation program lists less than half of the known graduates of that class. 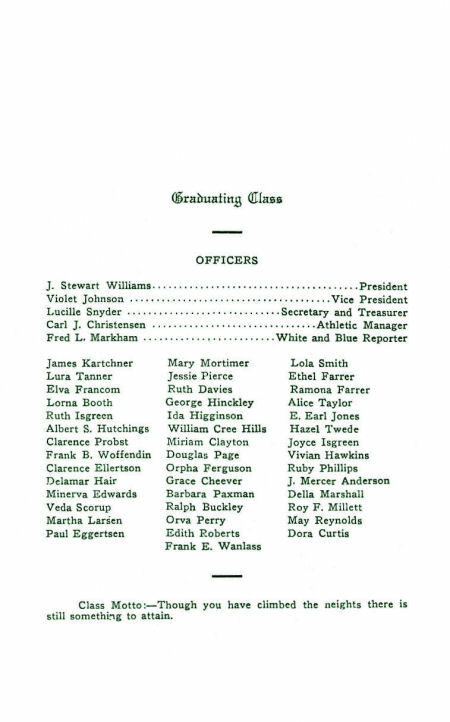 The others may have participated in a separate commencement exercise. 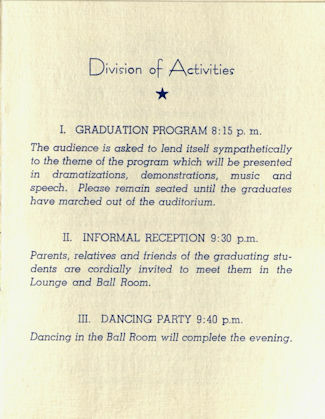 For example, the Commercial high school program often held separate graduation programs. 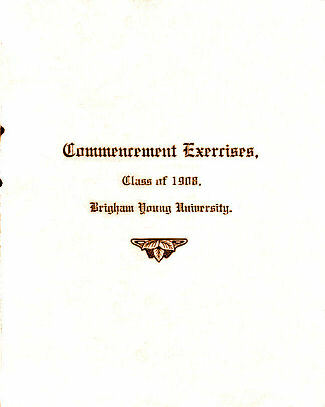 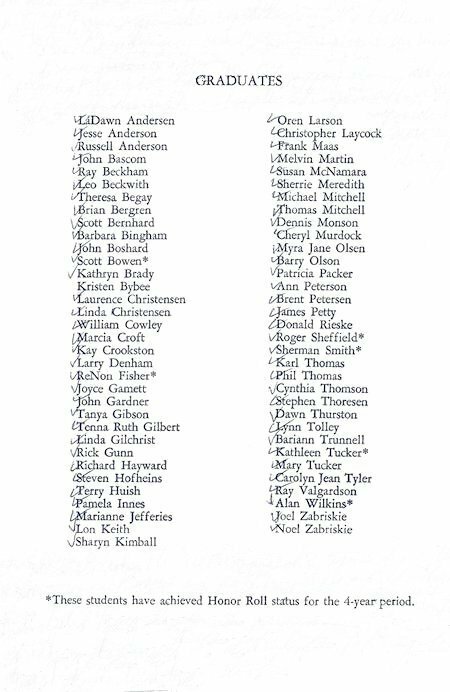 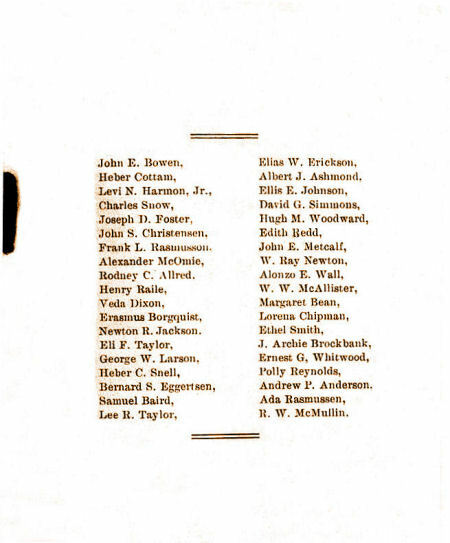 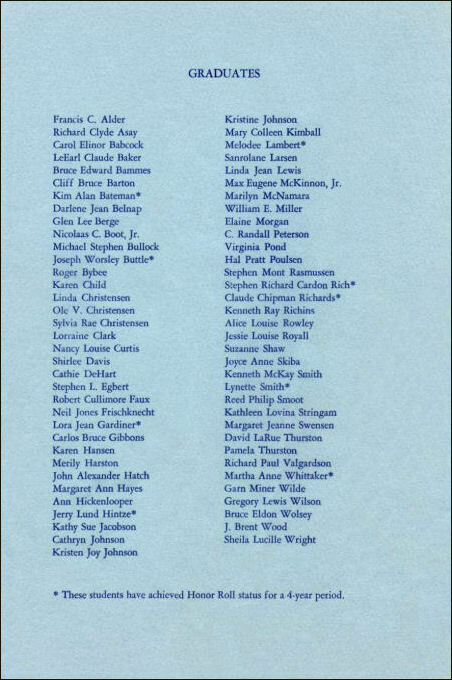 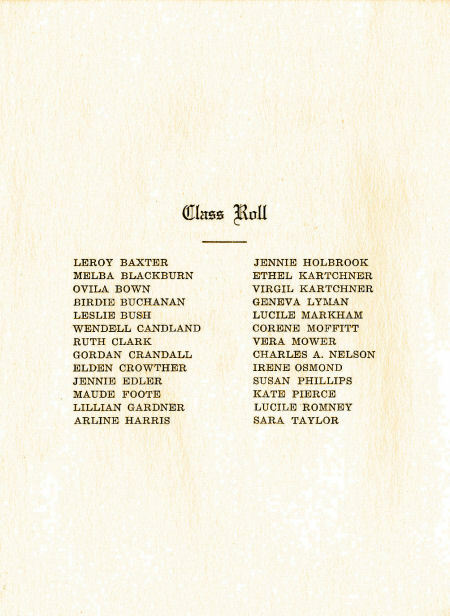 The above 1905 BYH graduation program lists about half of the known graduates of that class. 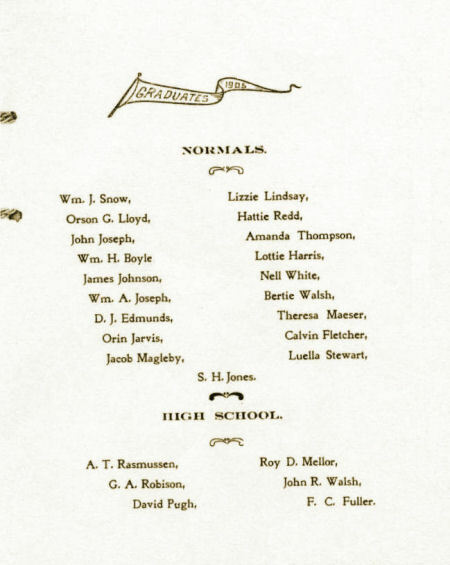 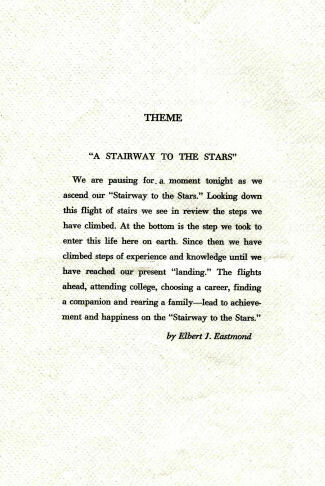 We are currently searching for the 1905 high school program for the Commercial students. 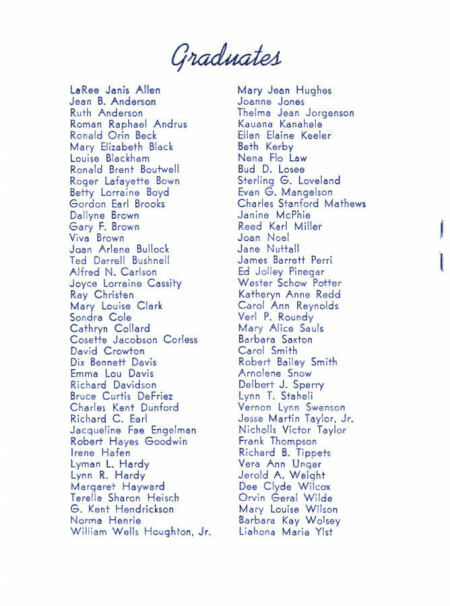 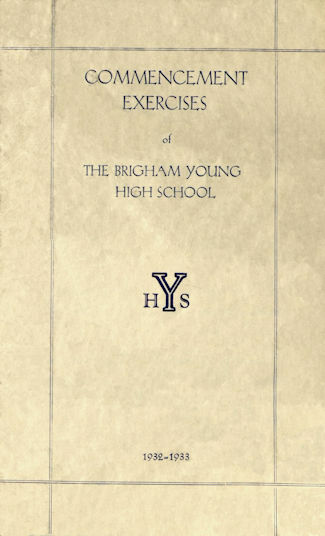 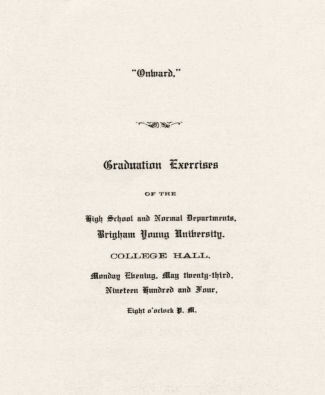 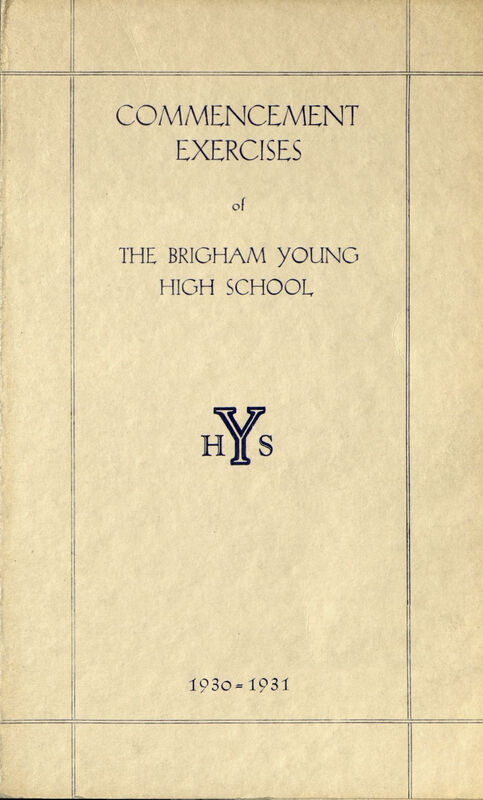 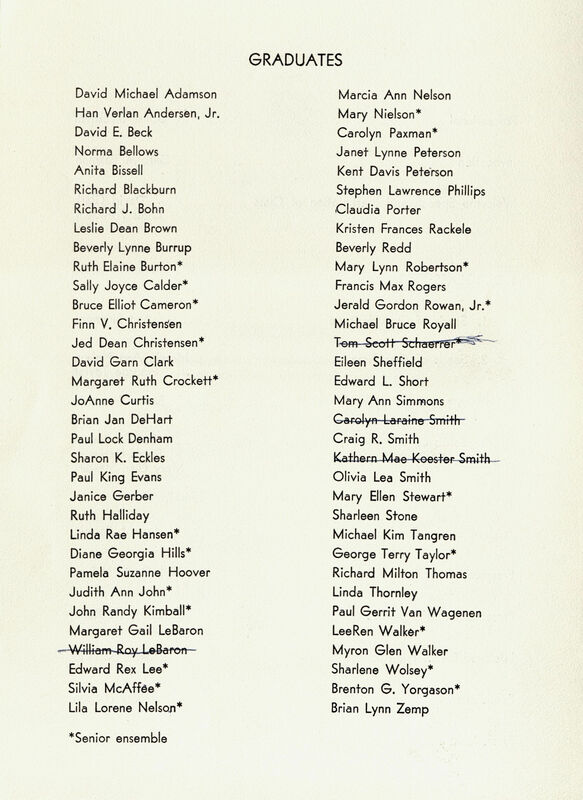 The above page says "Brigham Young University" when in fact all of the names on the following two pages are Brigham Young University High School graduates. 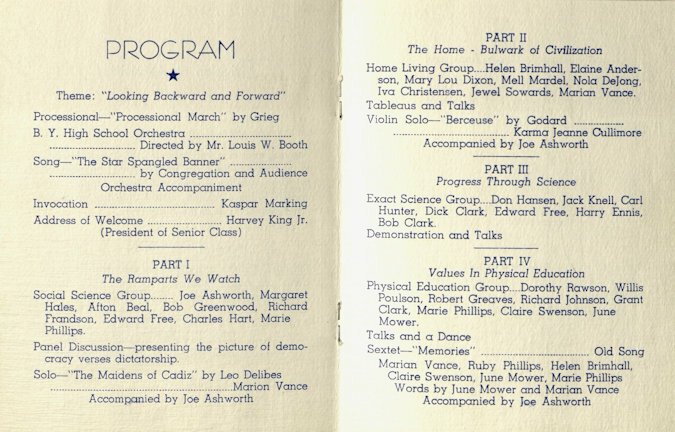 It appears that a four-page portion of this program is missing. 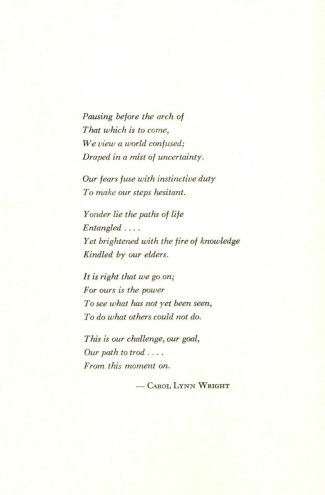 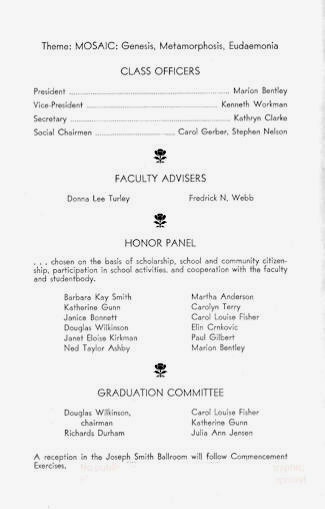 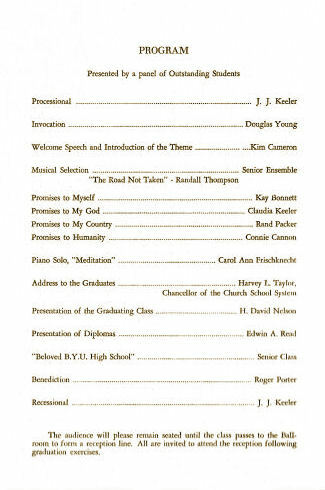 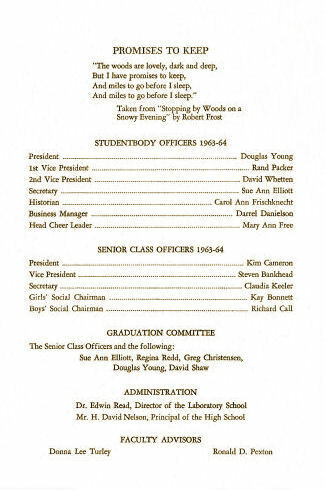 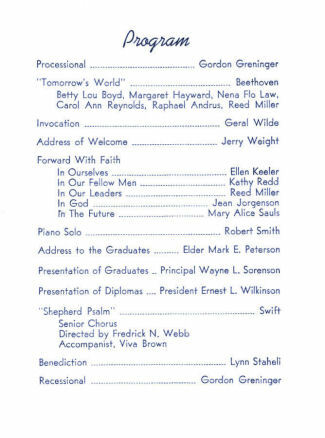 The traditional commencement program page listing speakers and musical numbers is missing. 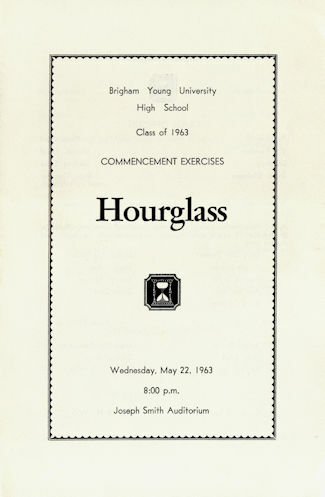 More than half of the BYH seniors known to have graduated that day are missing. 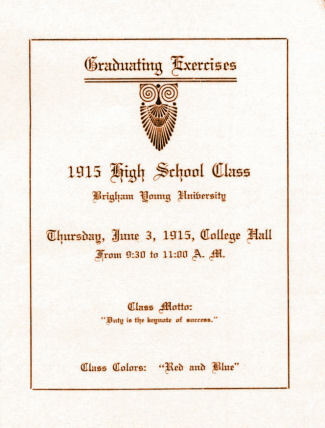 The four known Brigham Young University graduates of the Class of 1908 are not listed. 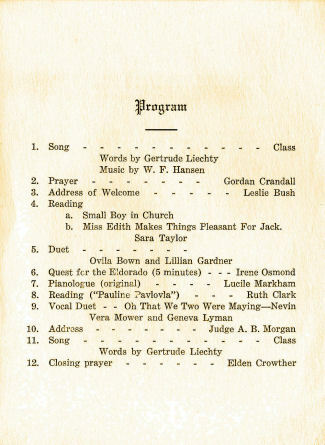 If you have a complete 1908 program, please share it with us. 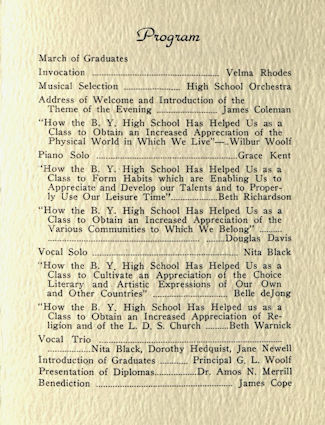 The above graduation program of the BYH Class of 1915 lists less than 75 percent of the students known to have graduated from BYH in 1915. 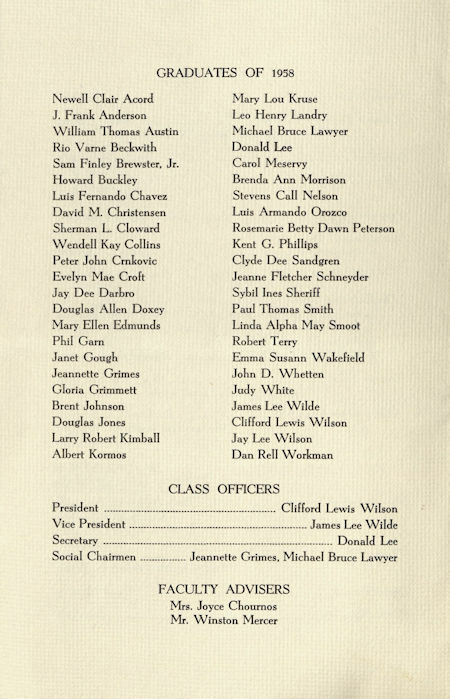 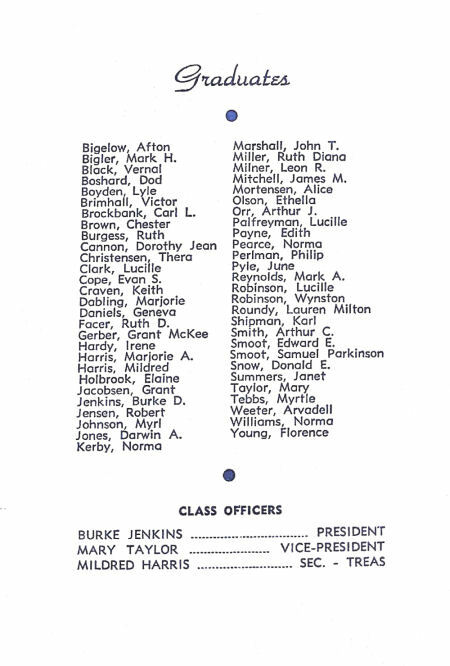 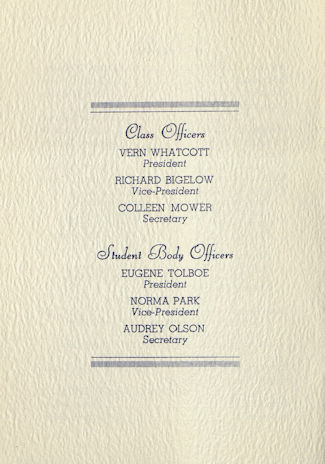 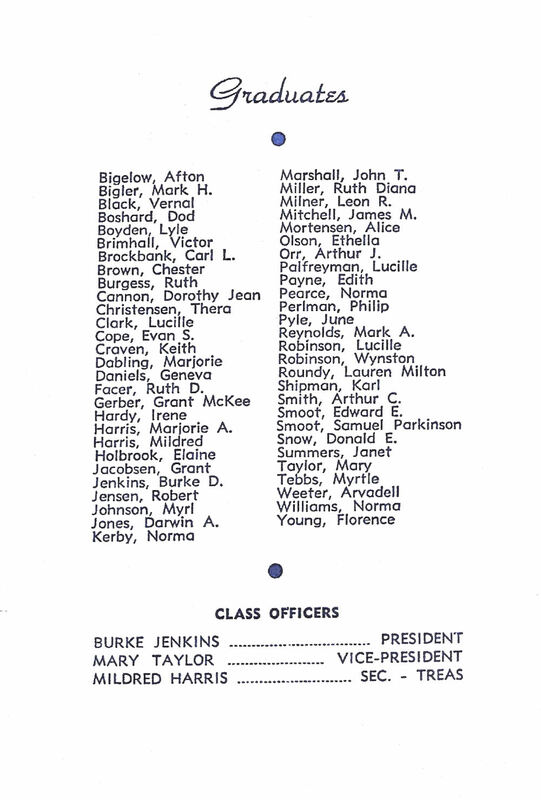 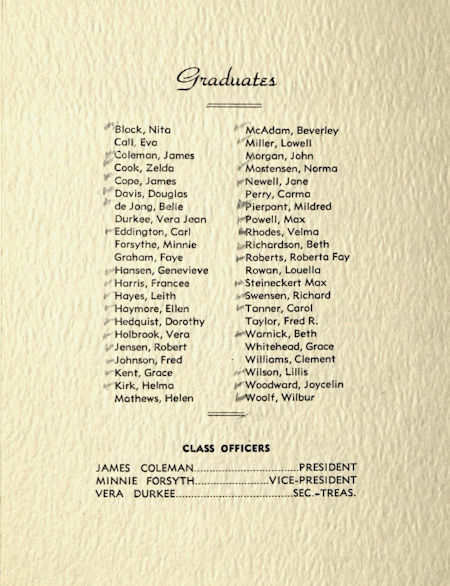 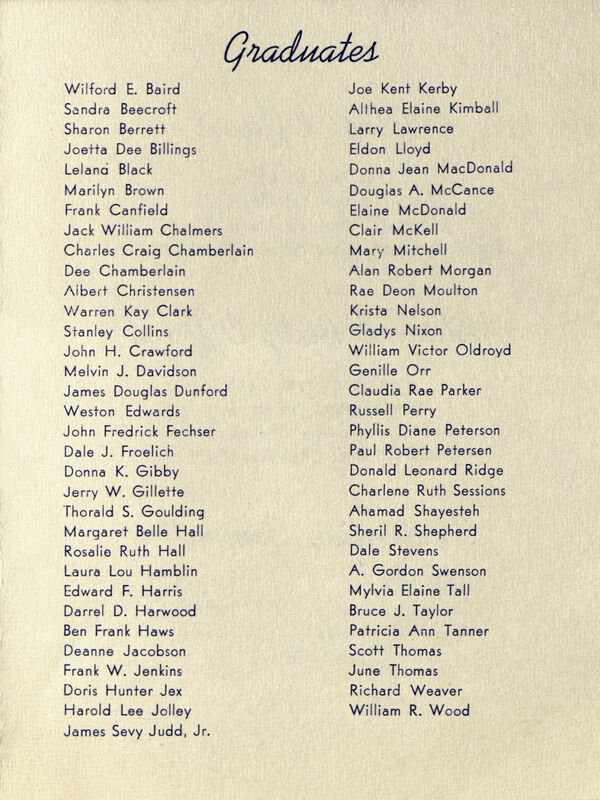 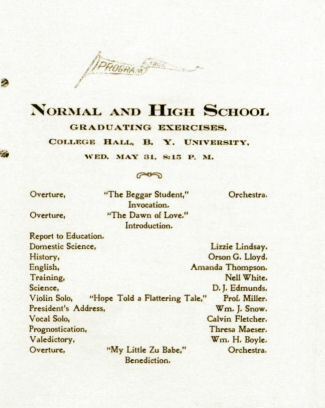 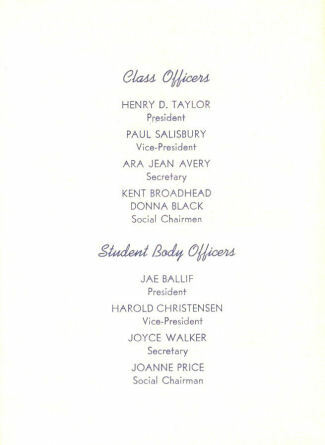 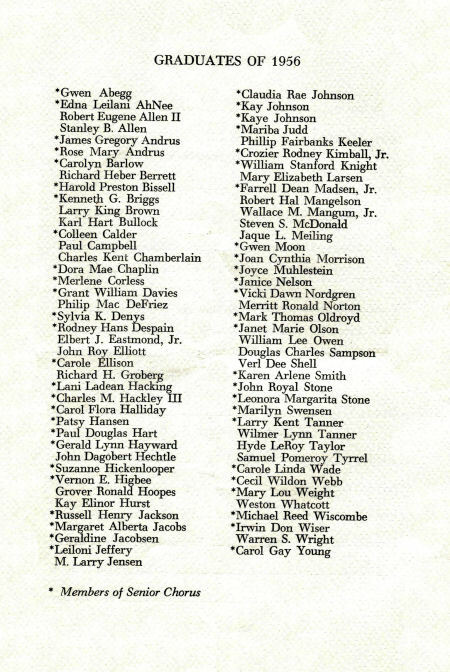 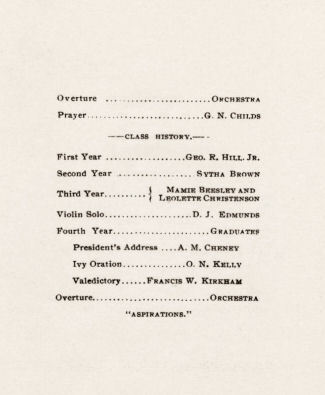 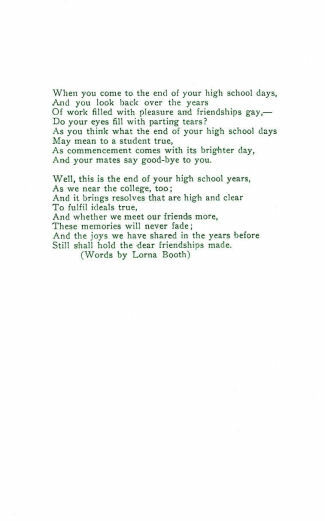 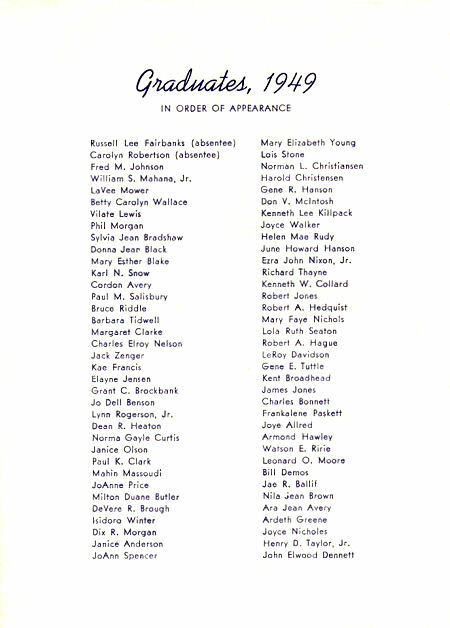 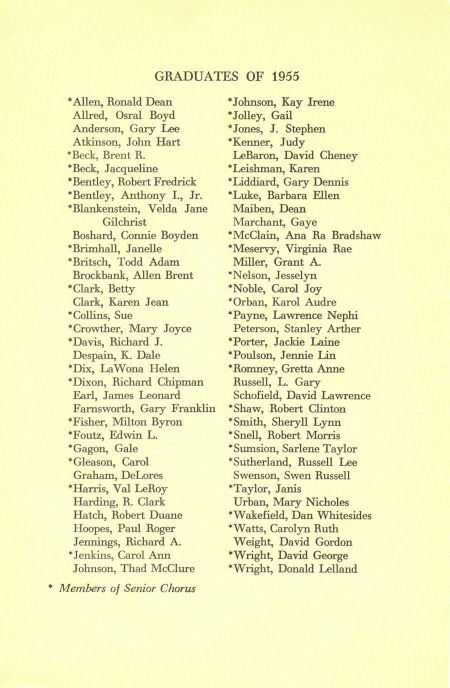 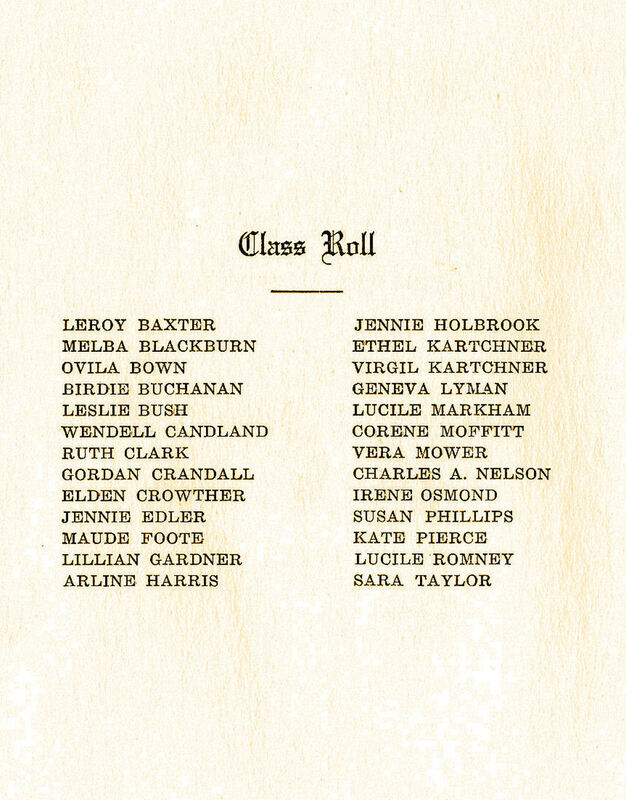 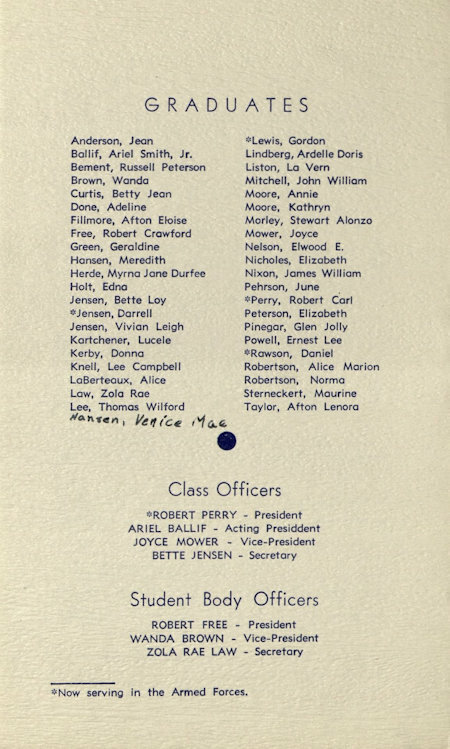 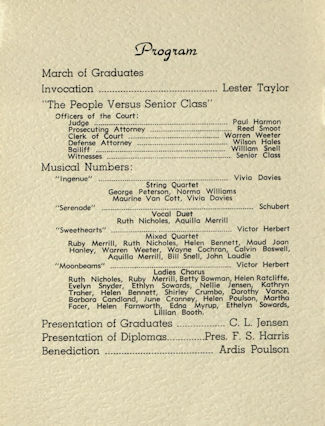 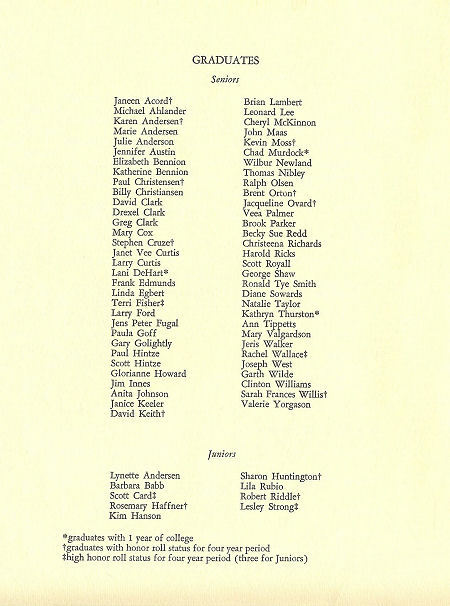 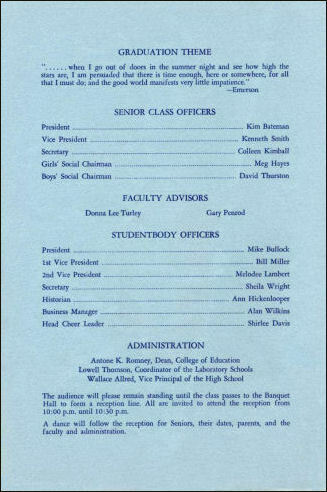 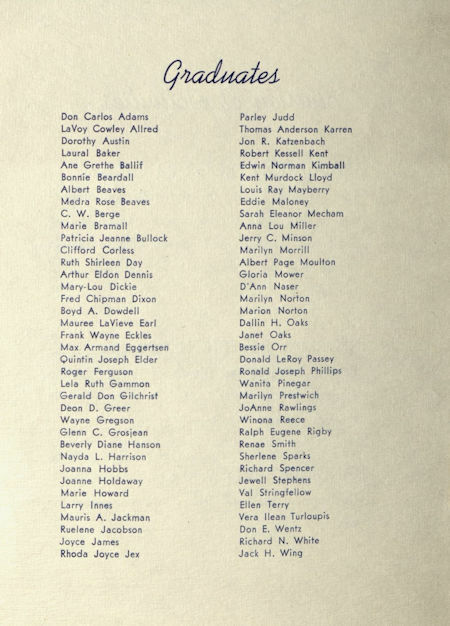 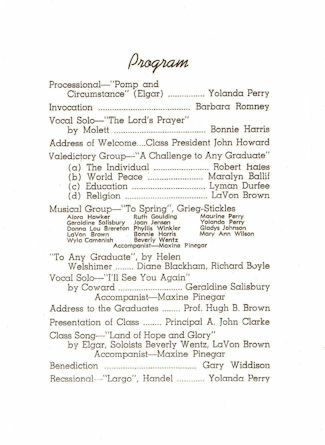 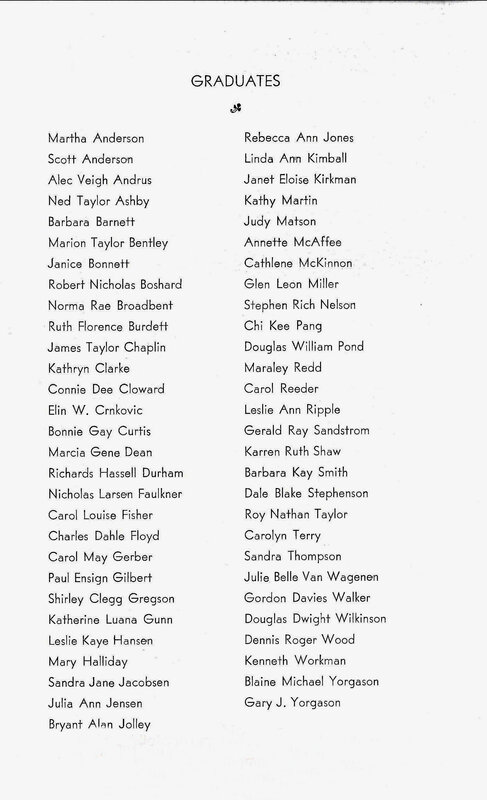 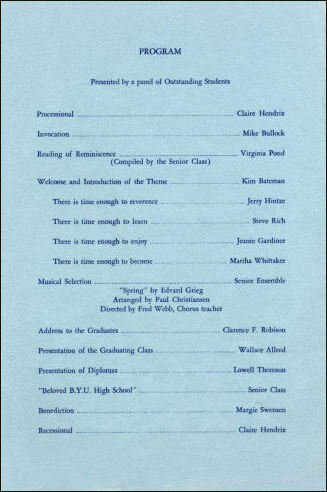 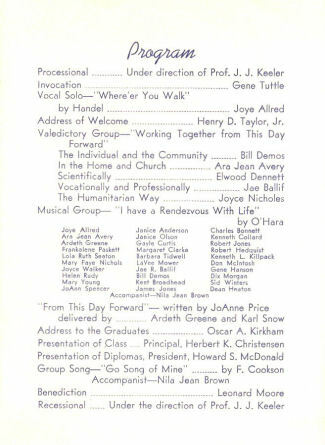 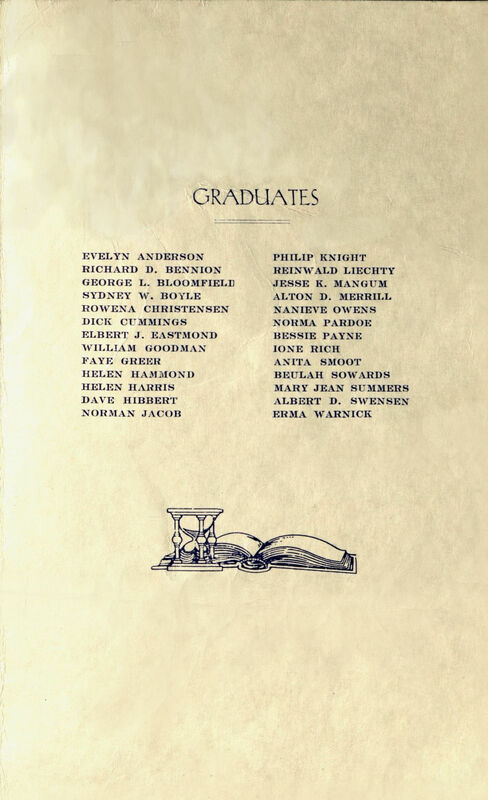 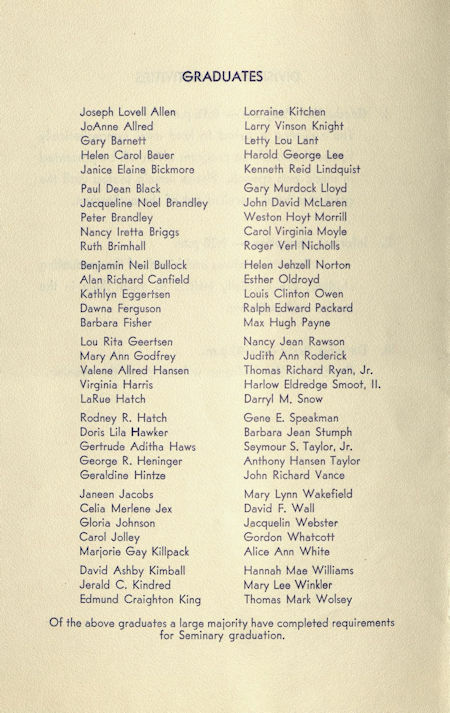 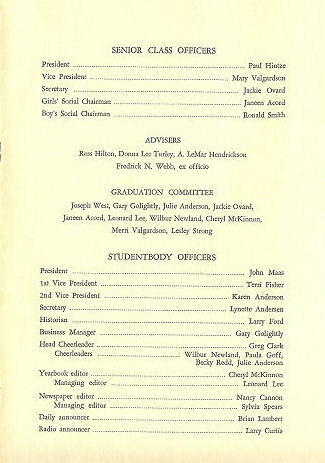 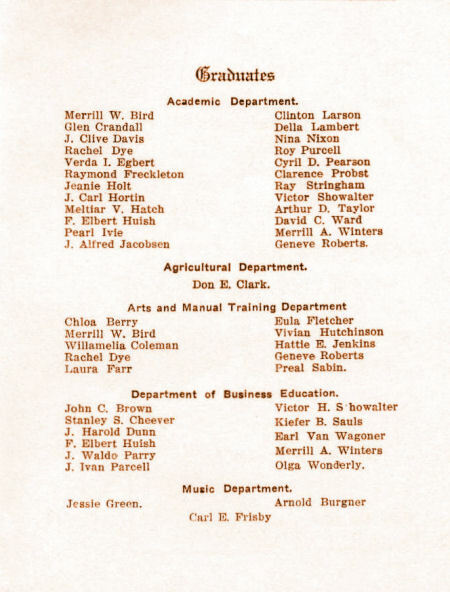 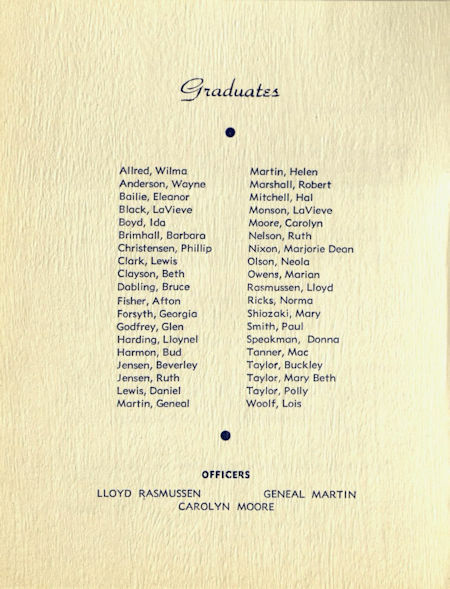 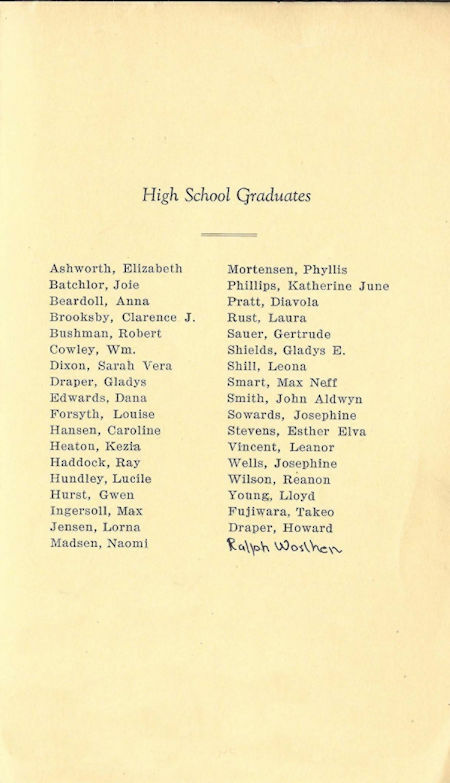 The above 1925 BYH graduation program lists about half of the known graduates of that class. 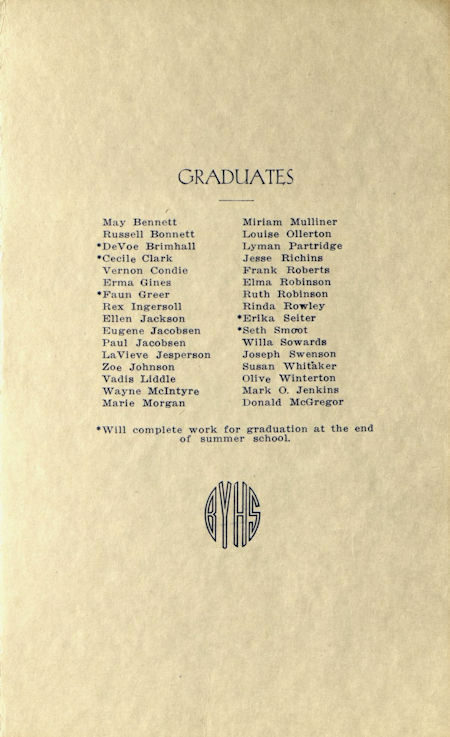 The others may have participated in a separate commencement exercise. 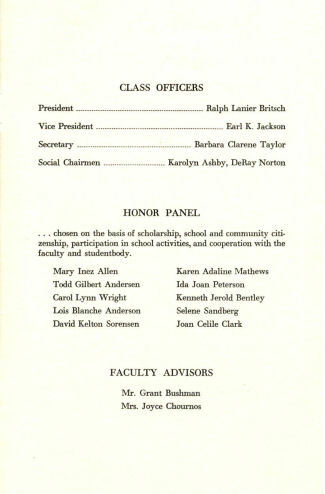 For example, the Commercial high school program often held separate graduation programs. 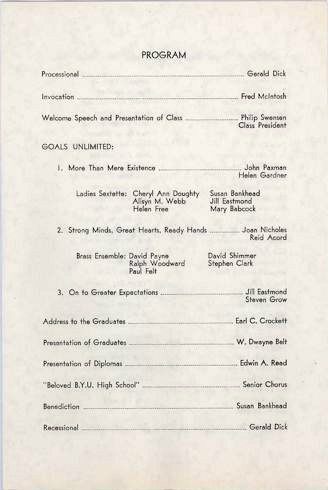 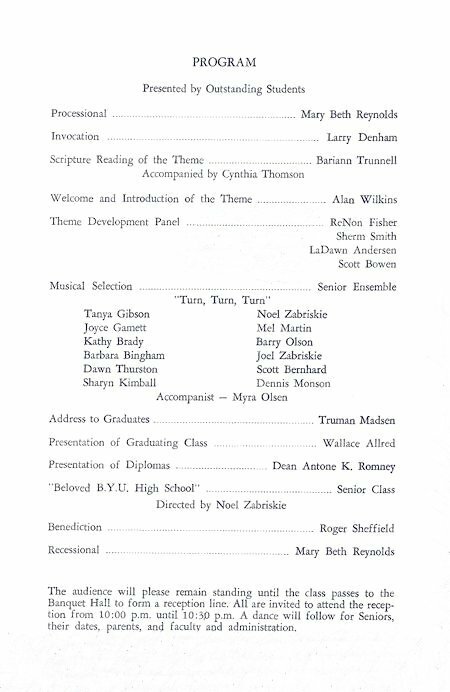 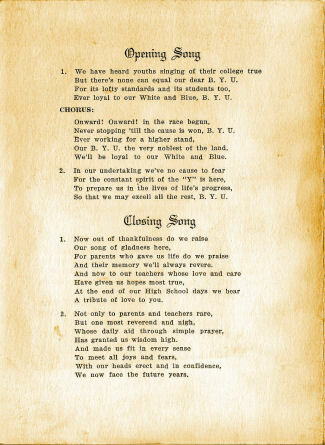 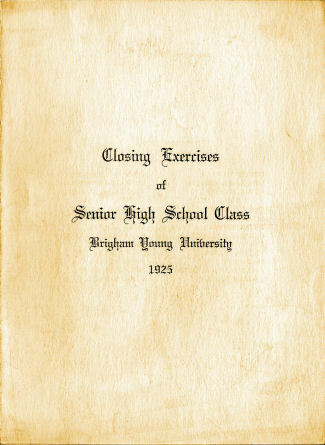 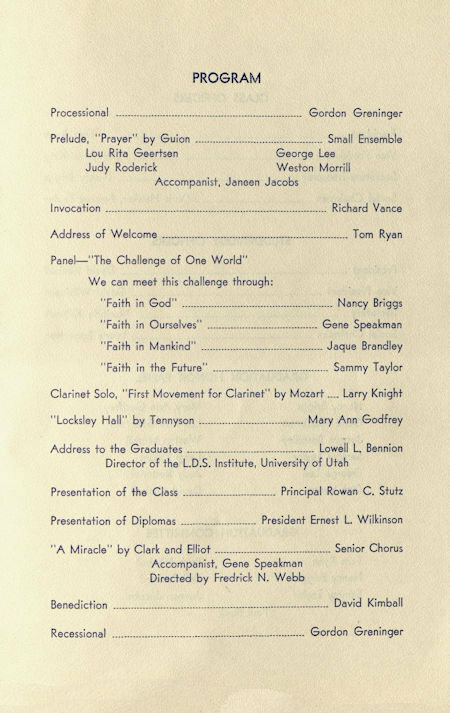 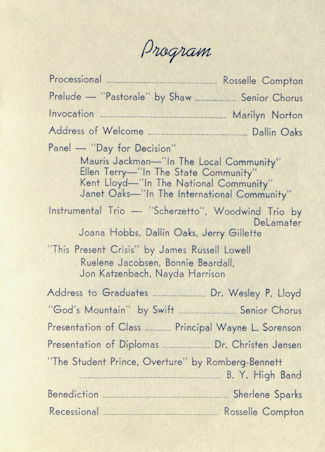 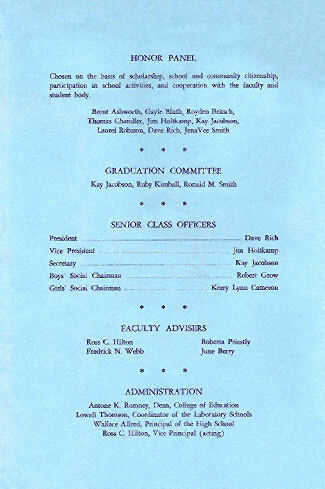 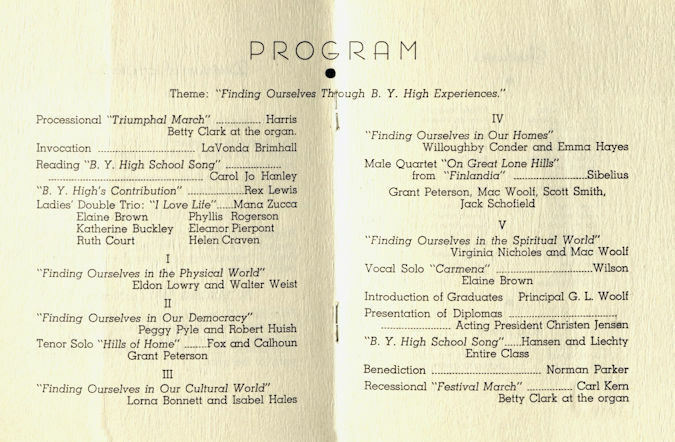 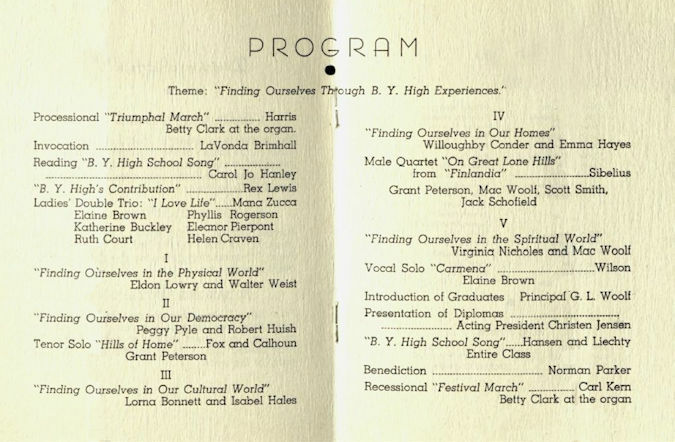 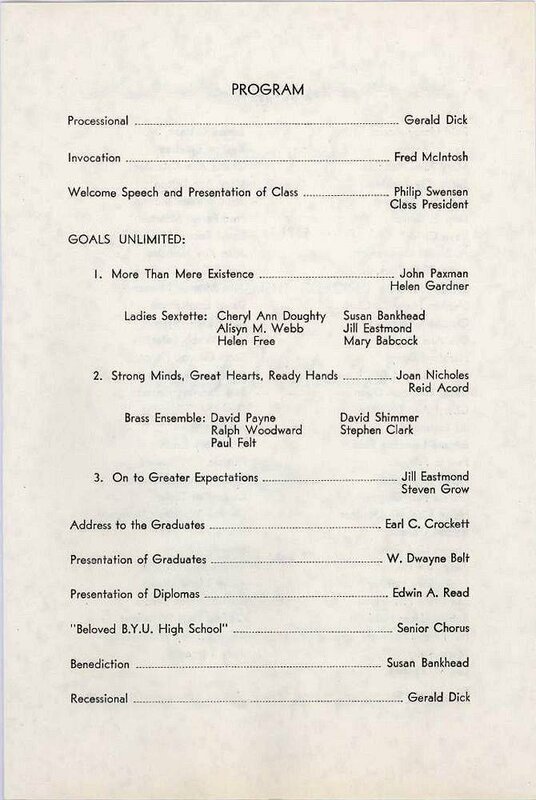 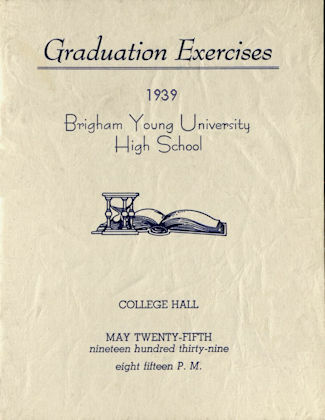 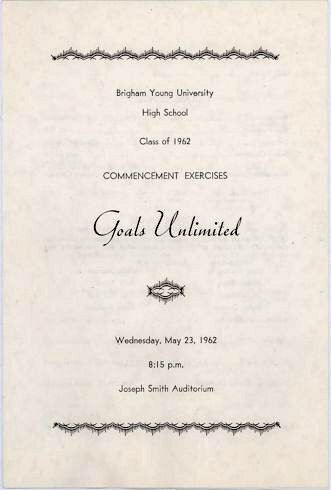 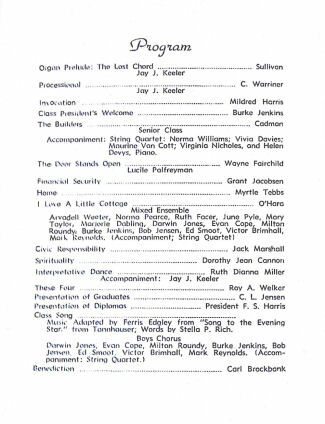 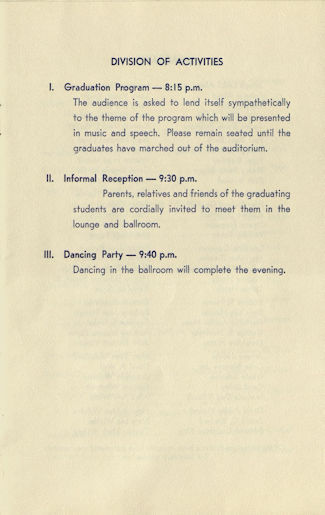 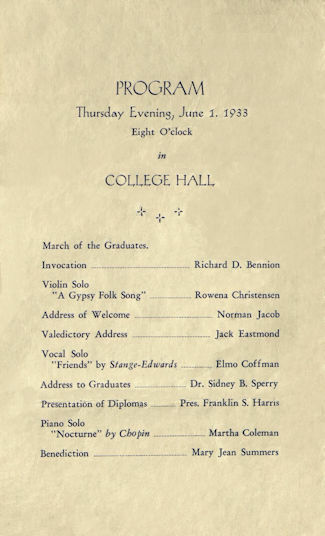 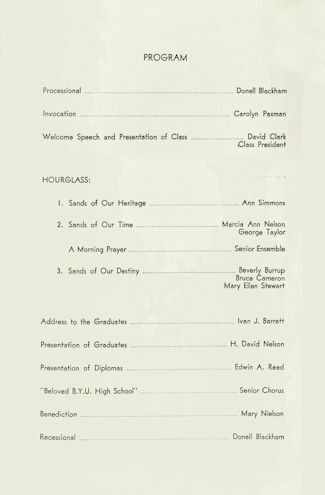 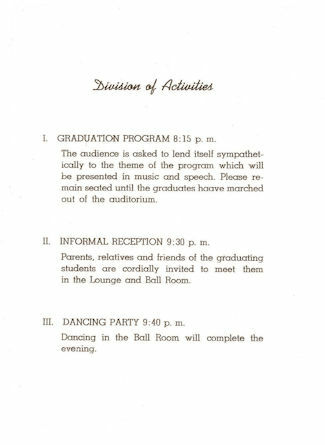 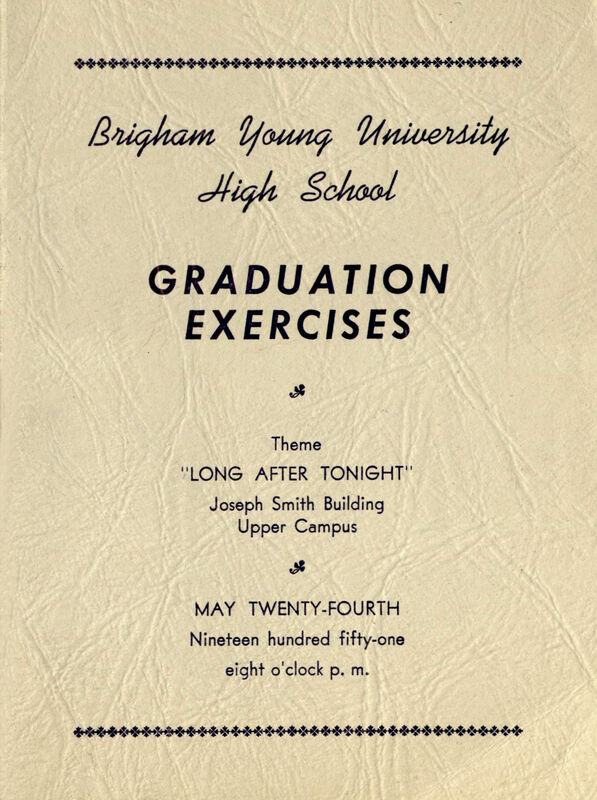 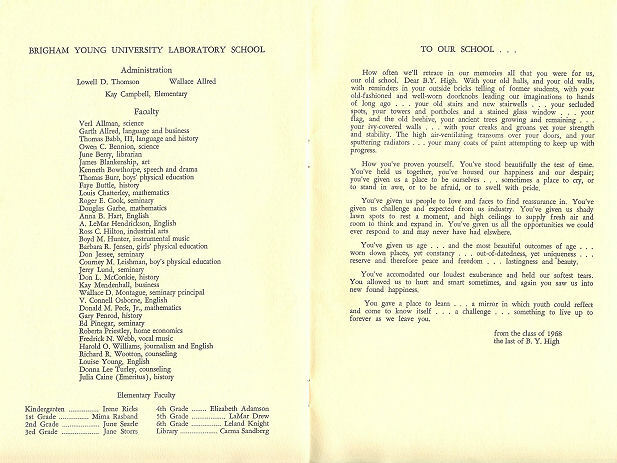 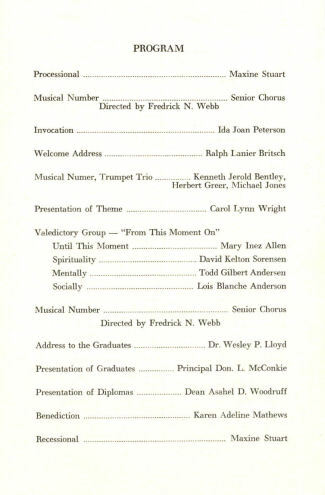 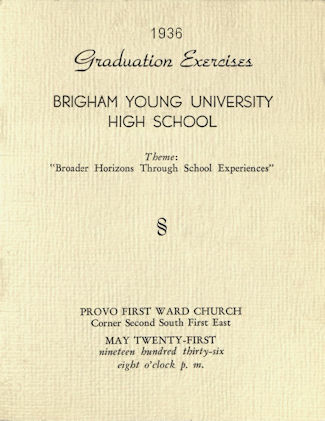 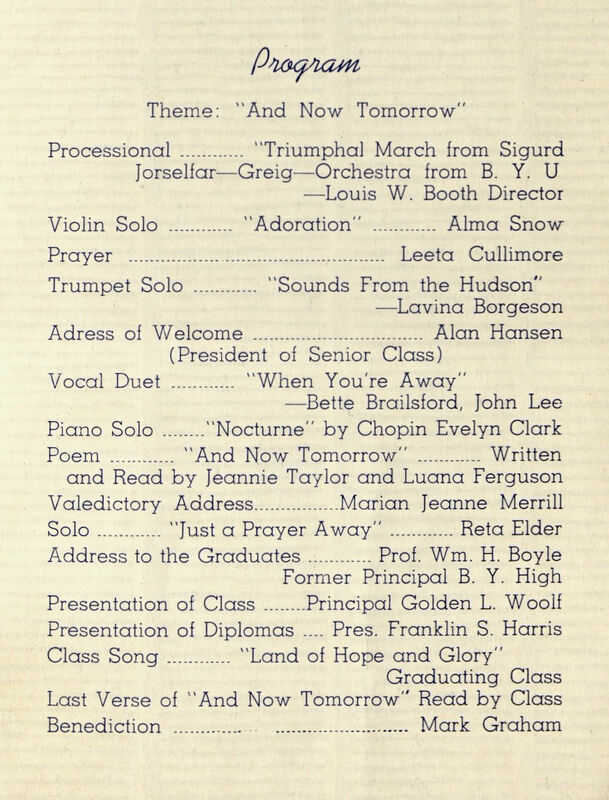 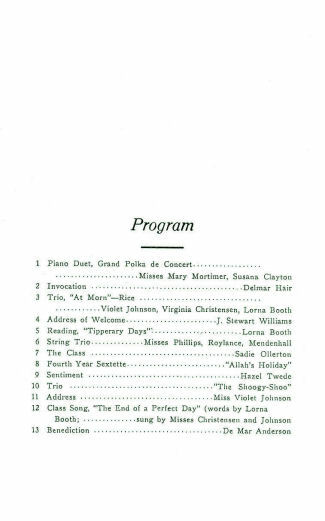 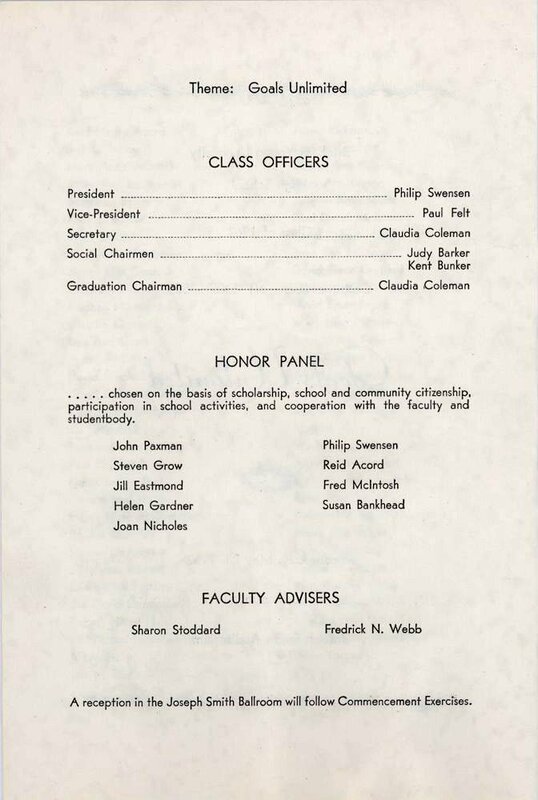 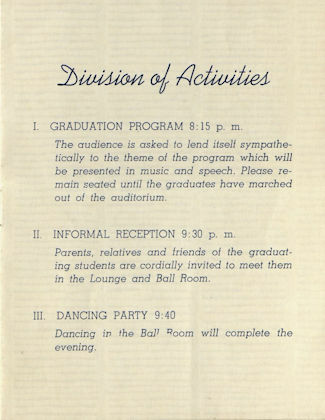 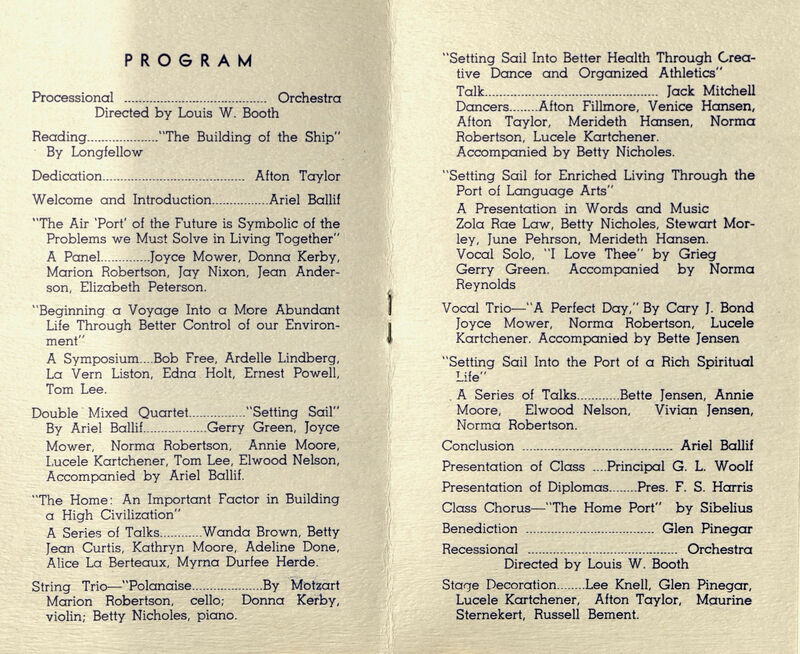 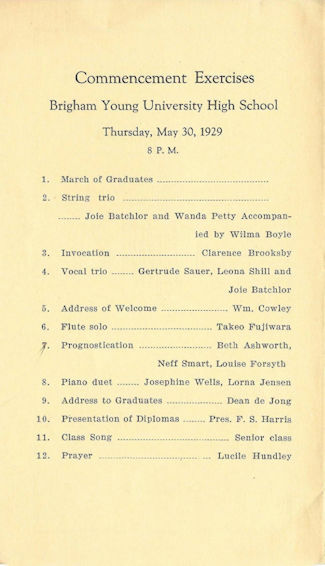 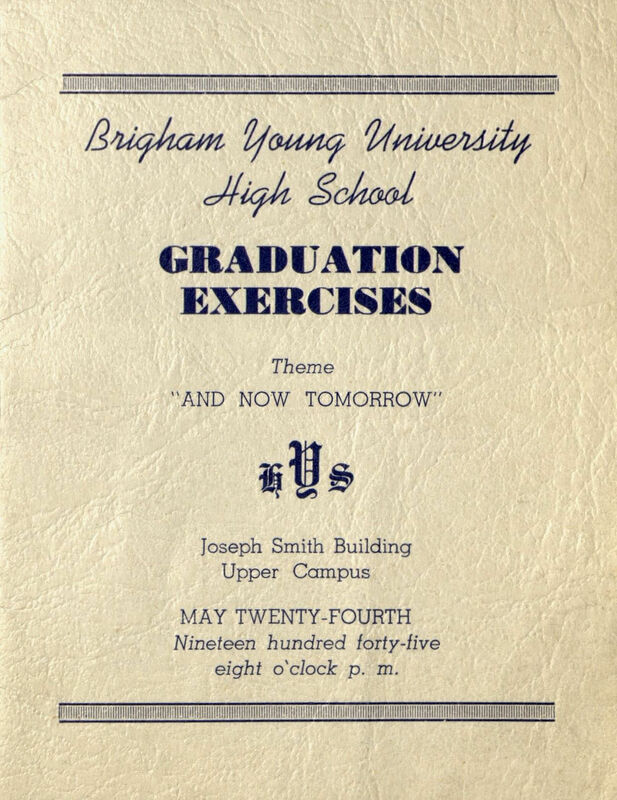 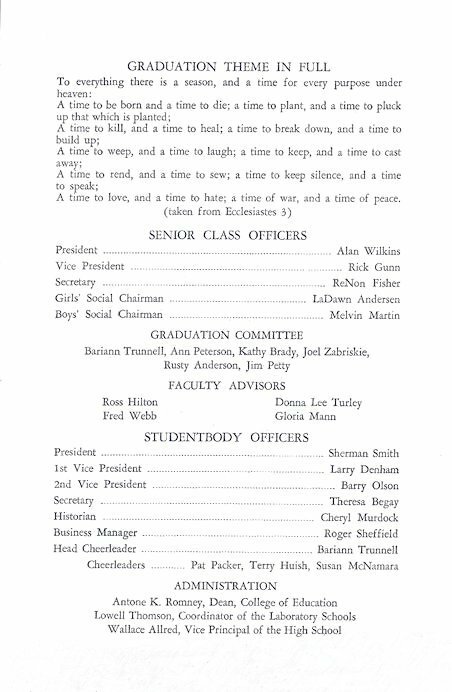 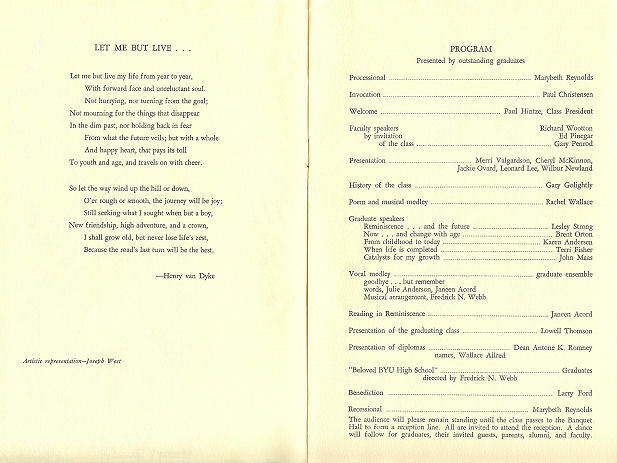 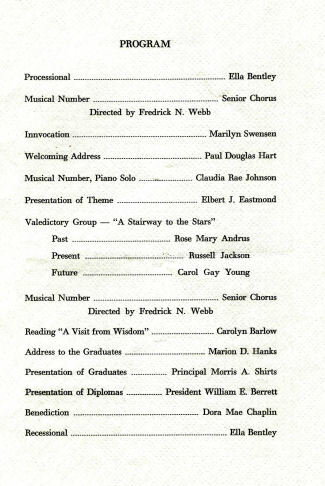 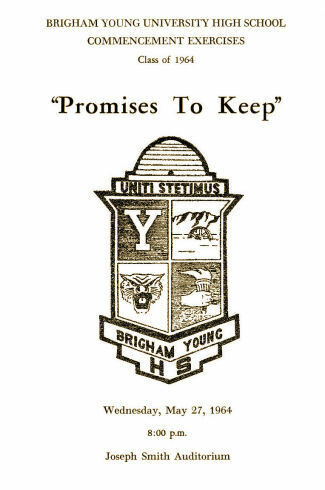 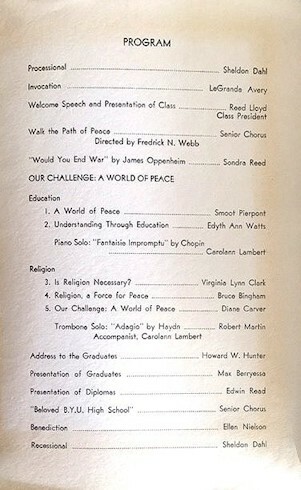 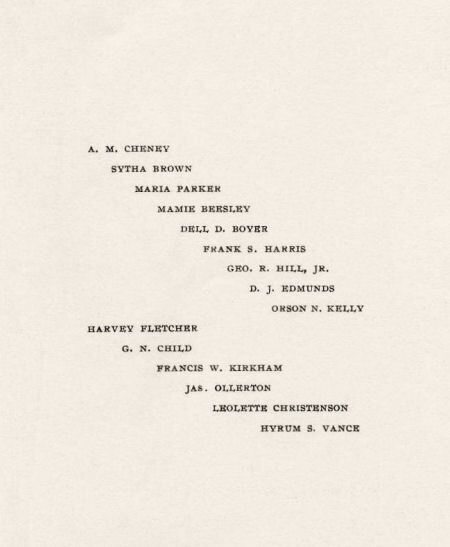 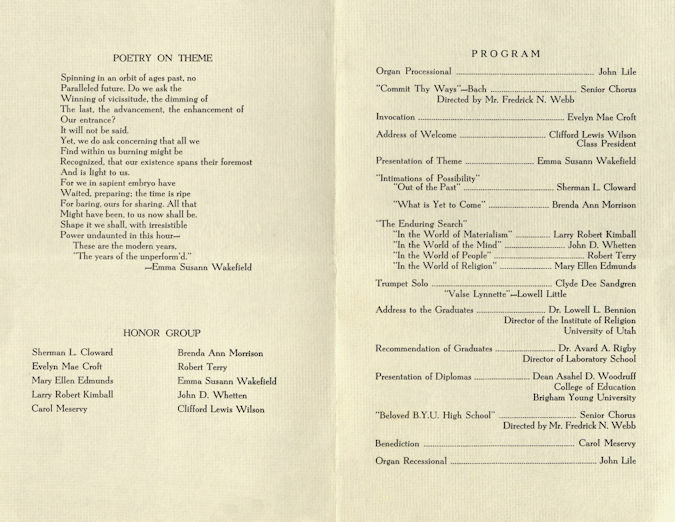 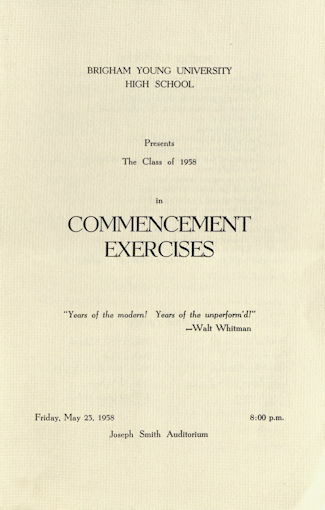 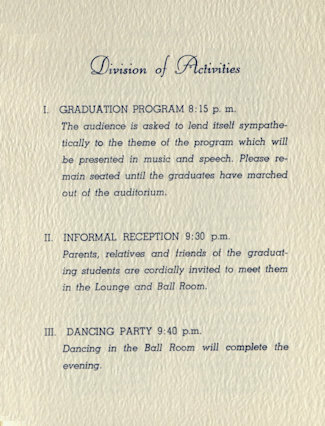 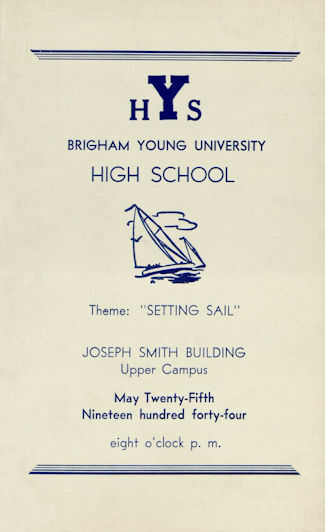 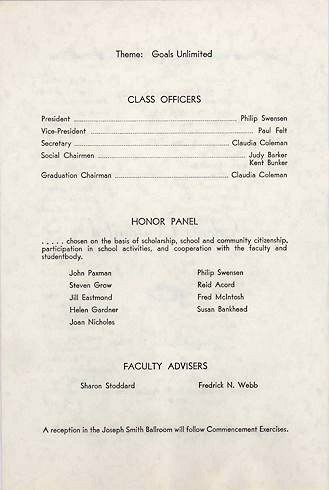 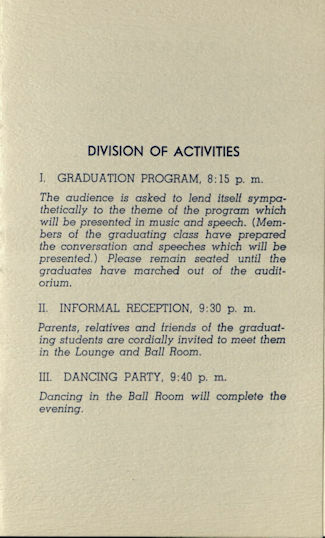 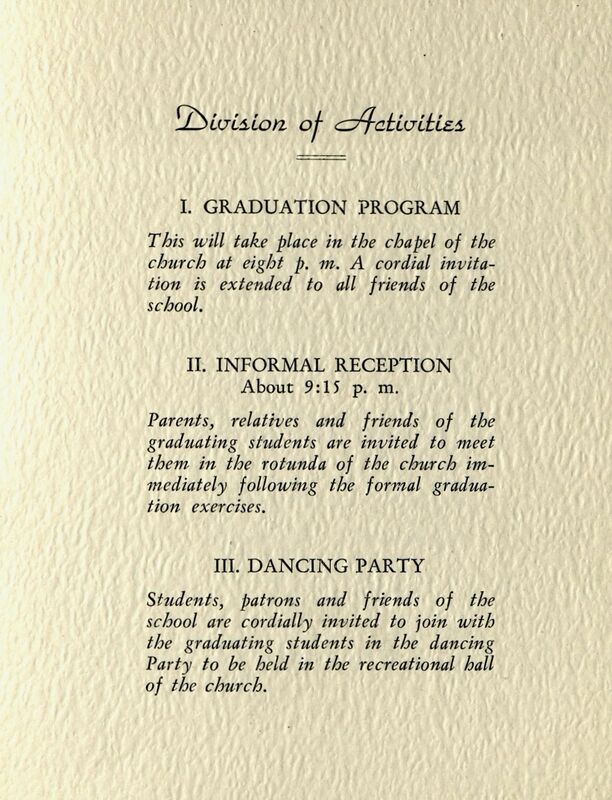 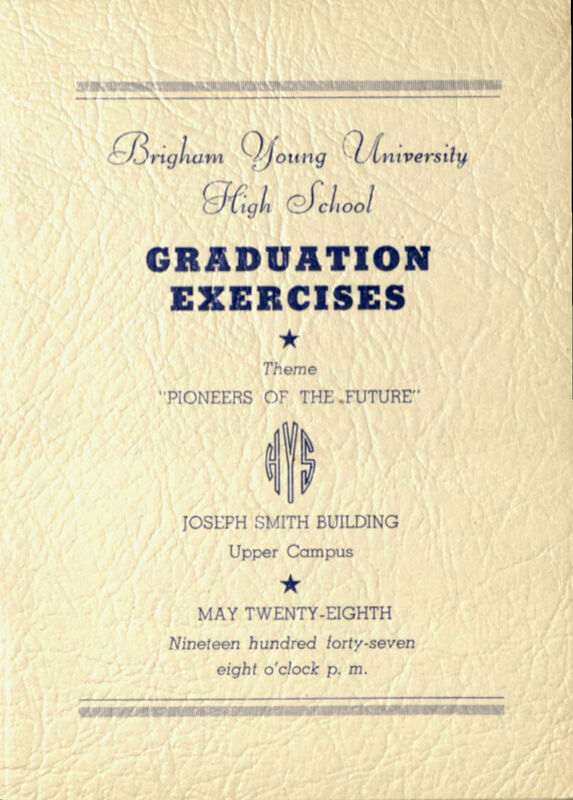 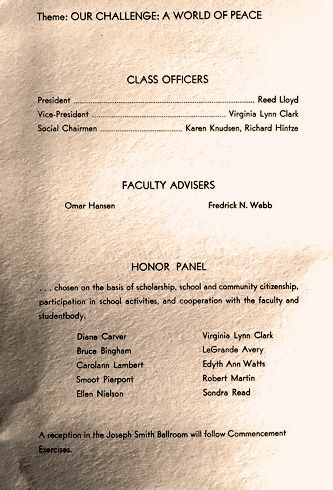 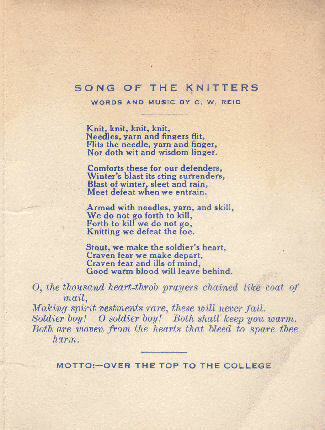 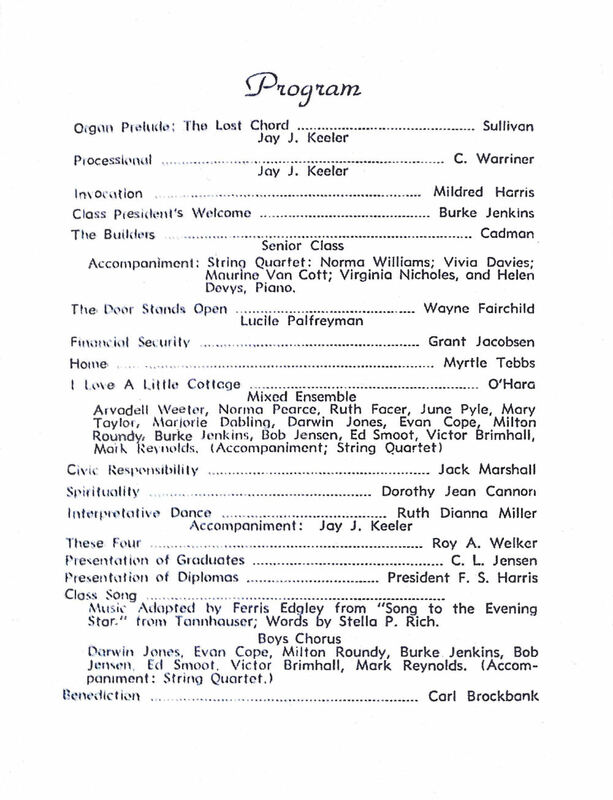 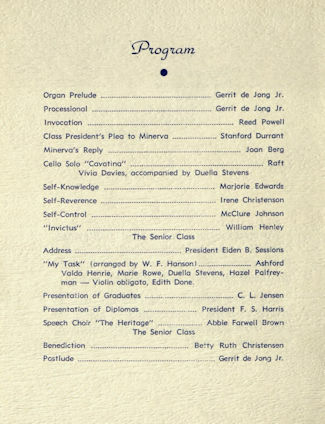 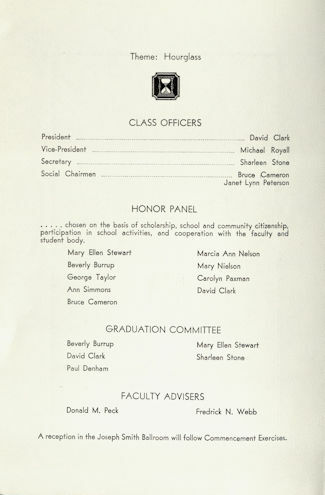 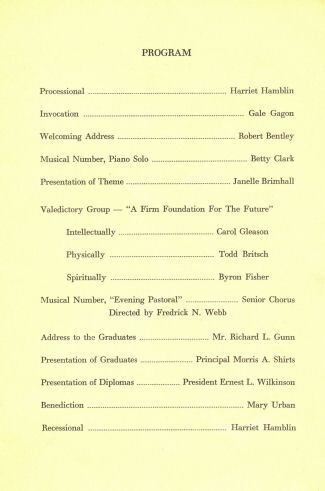 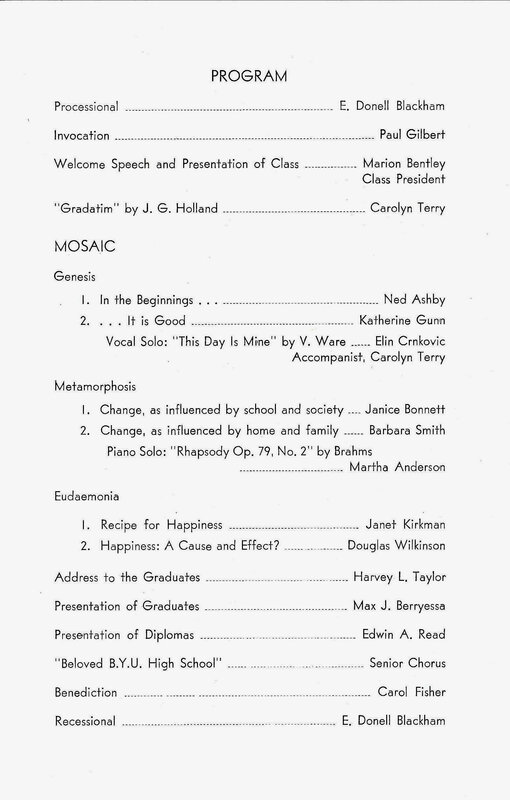 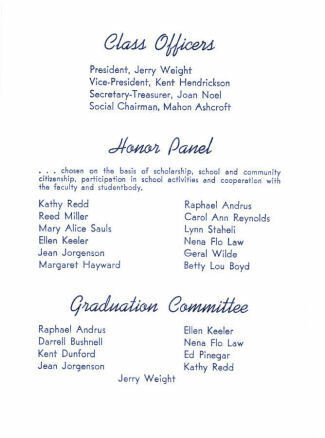 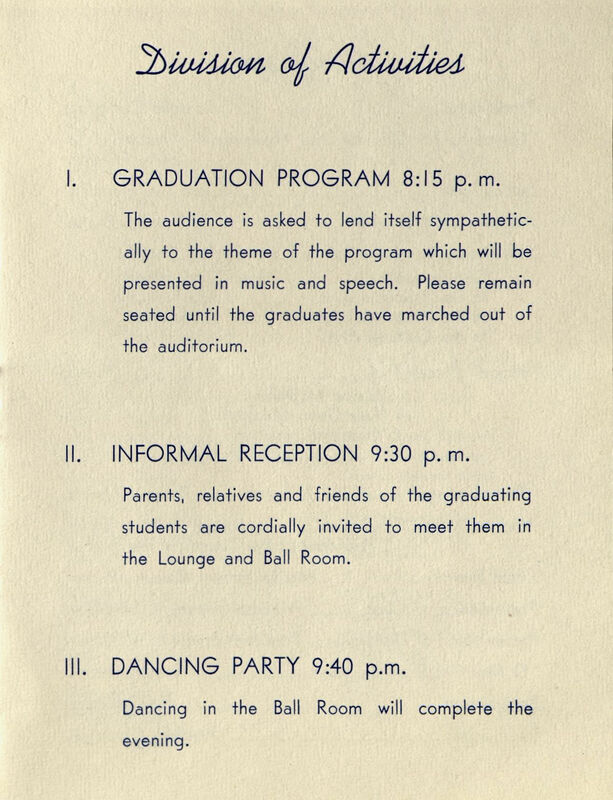 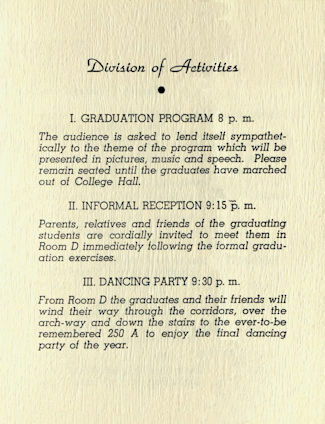 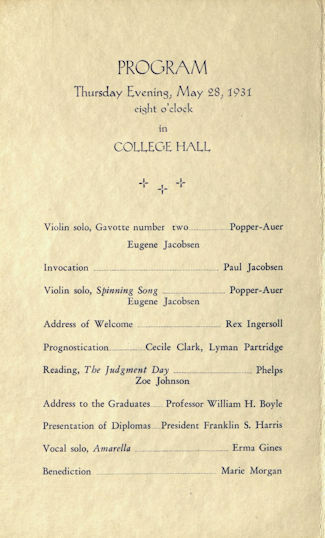 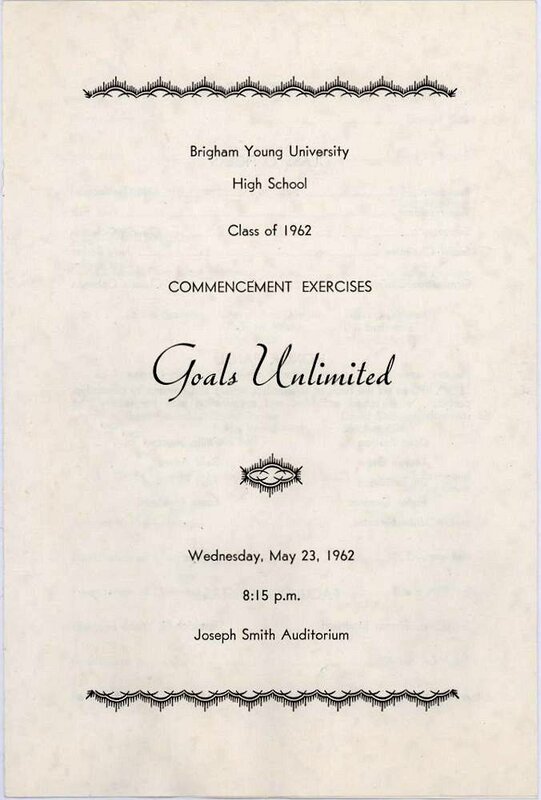 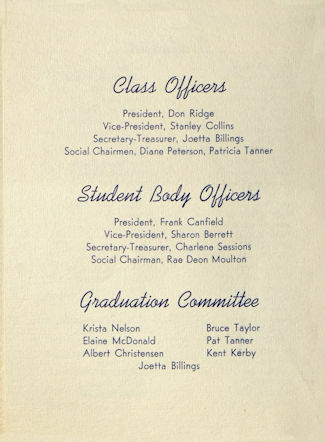 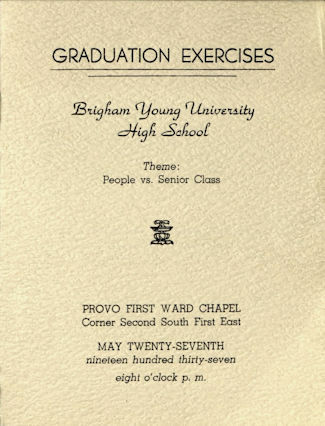 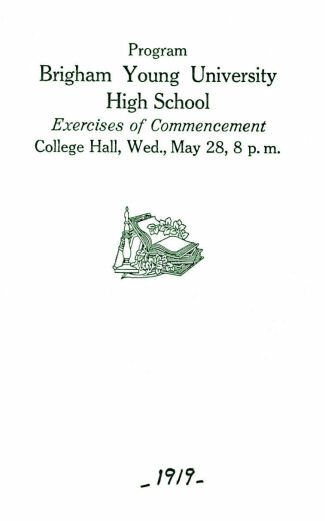 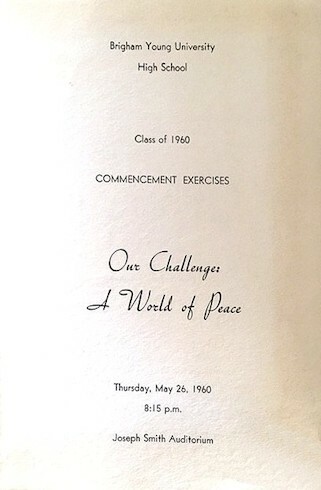 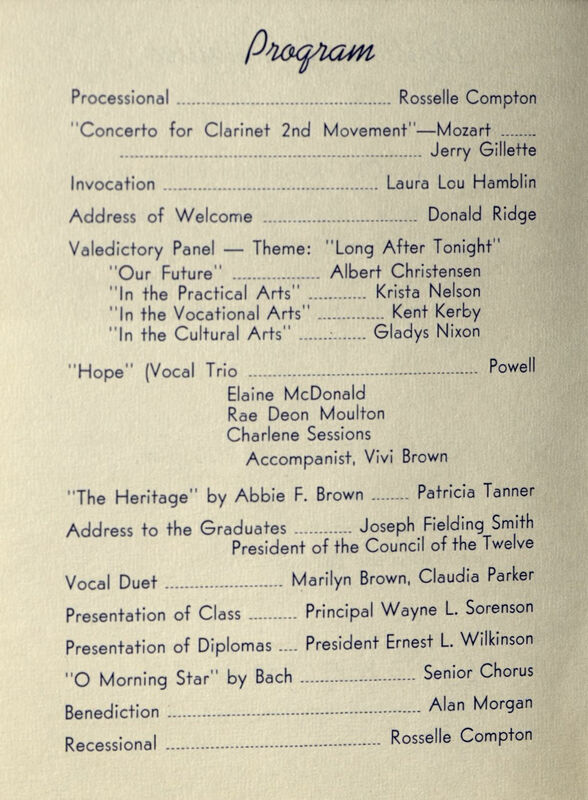 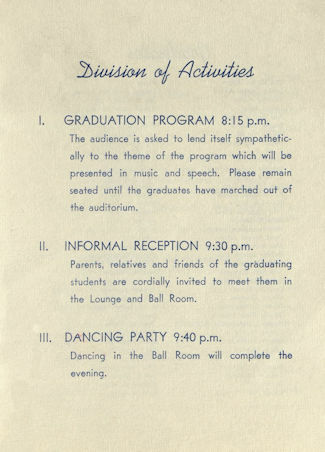 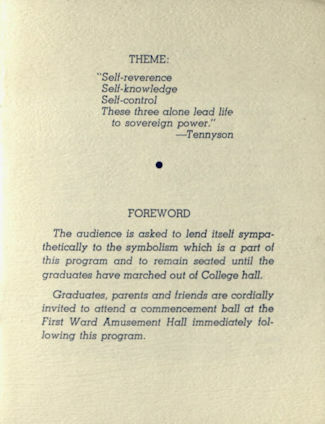 Note: We were not there, but it is quite probable that the five student speeches listed above in this 1936 program turned out to be the most boring, insipid orations ever delivered at any Brigham Young High School Graduation Exercise in history. 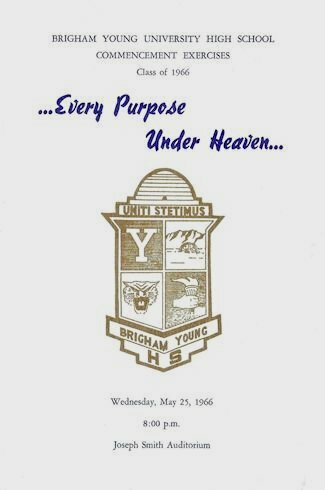 We extend our belated sympathies to everyone involved in any way. 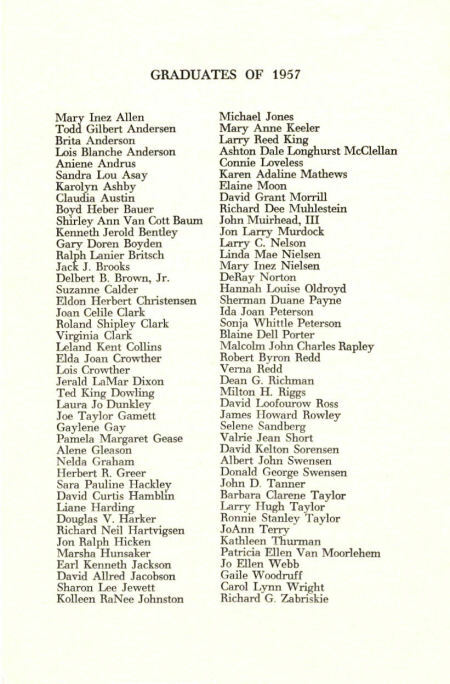 We do not know the meaning of the cross outs on some of the names. 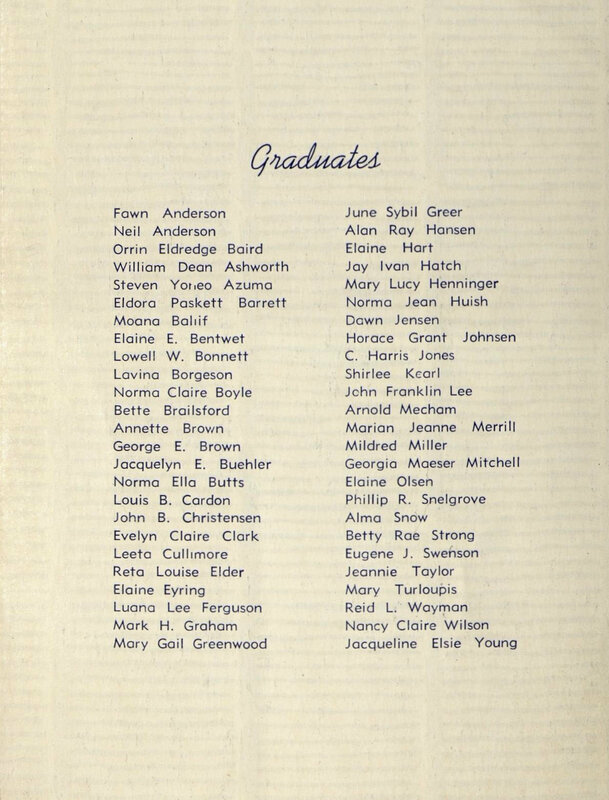 It might indicate graduates unable to attend Commencement, or students who did not fulfill graduation requirements by Commencement but who may have qualified after summer school, or some other explanation. 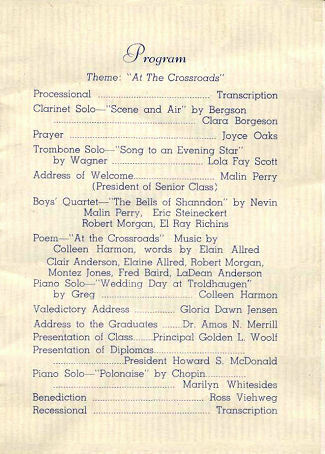 Thanks to Velma Christensen for saving this program in her scrapbook. 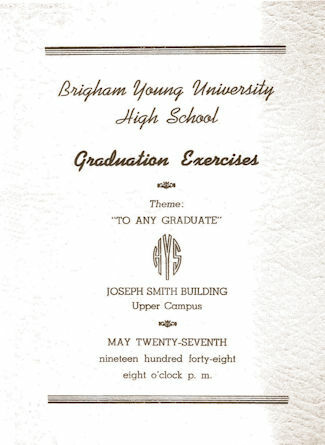 by providing photocopies/scans for missing years!